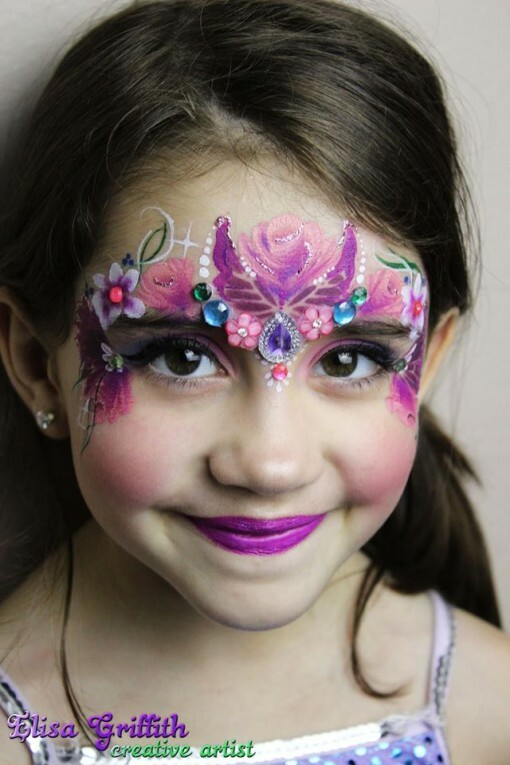 Susy FunnyCheeks tear drops will make your eyes smile an encourage you to practice! 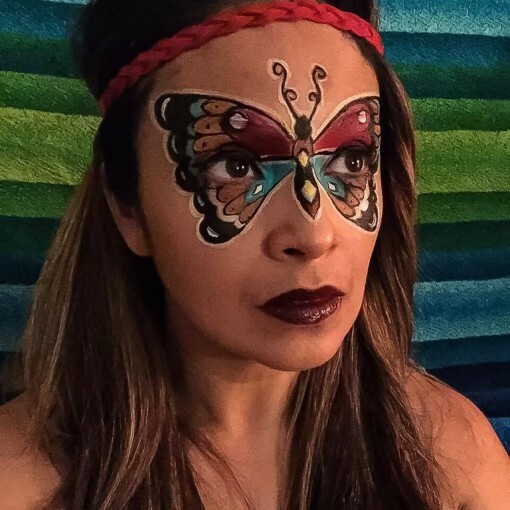 Rosa Mahal gives side eye Butterfly action that is just awesome! 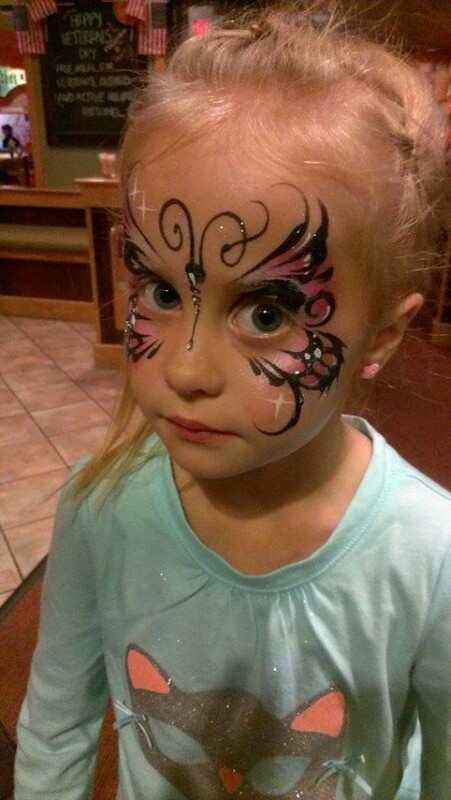 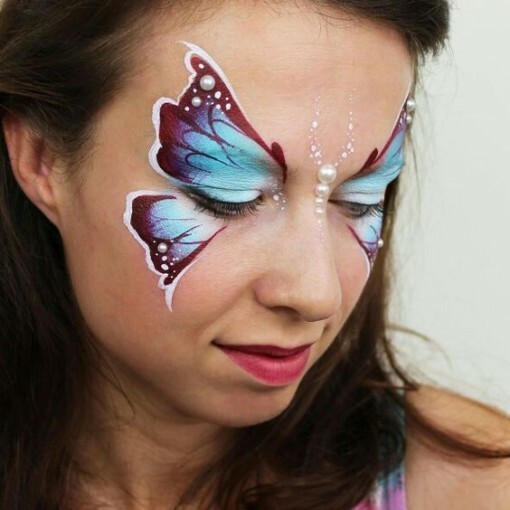 Love this side eye butterfly by Mandy Moody there’s a tutorial for it too! 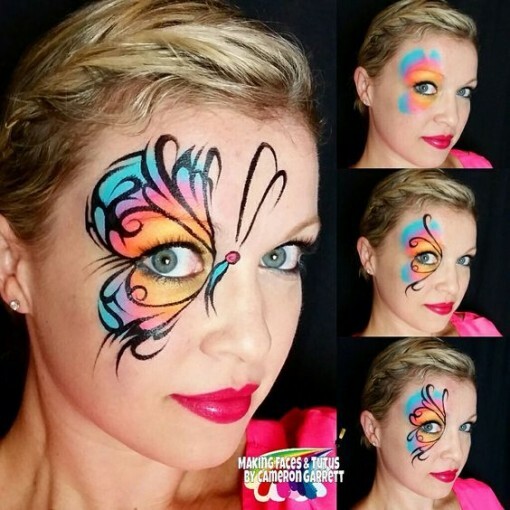 Natalee Davies mixes the perfect blend of color and beauty! 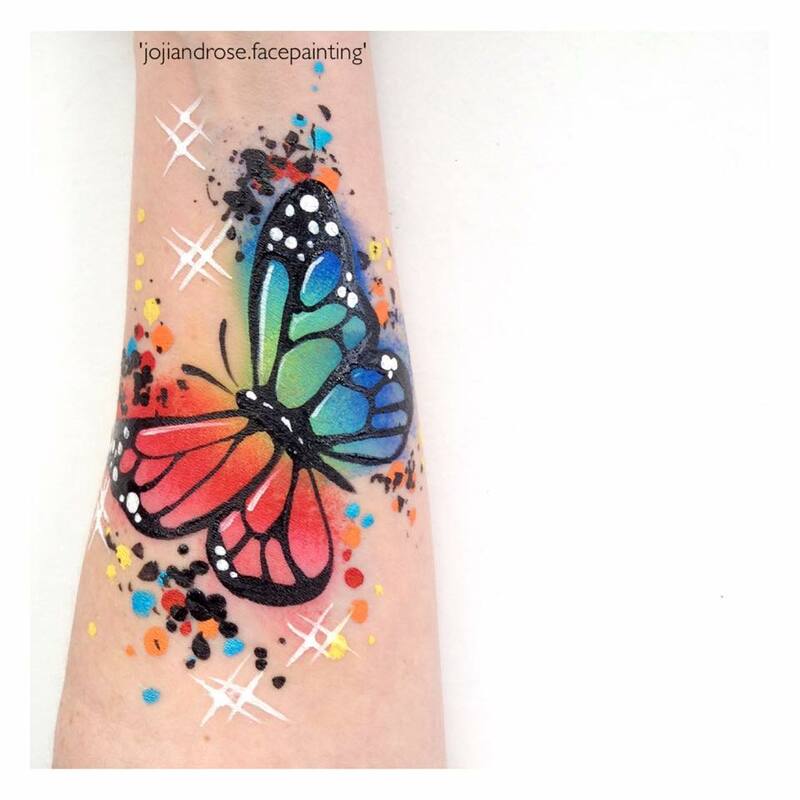 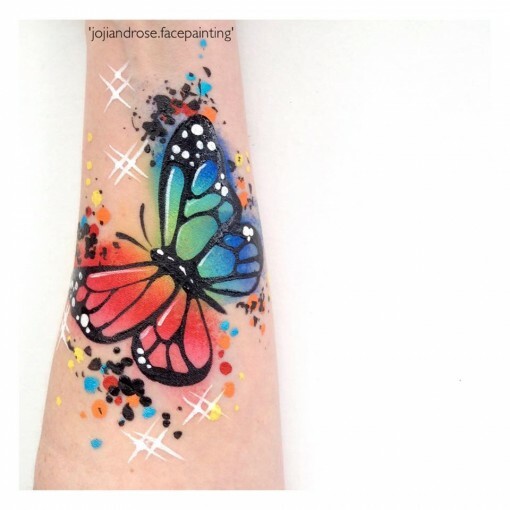 Sometimes you just want a rainbow butterfly to land on your arm and add rainbow sparkles. 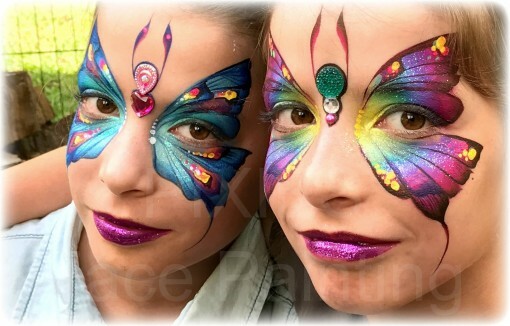 Jojo and rose face painting nailed it! 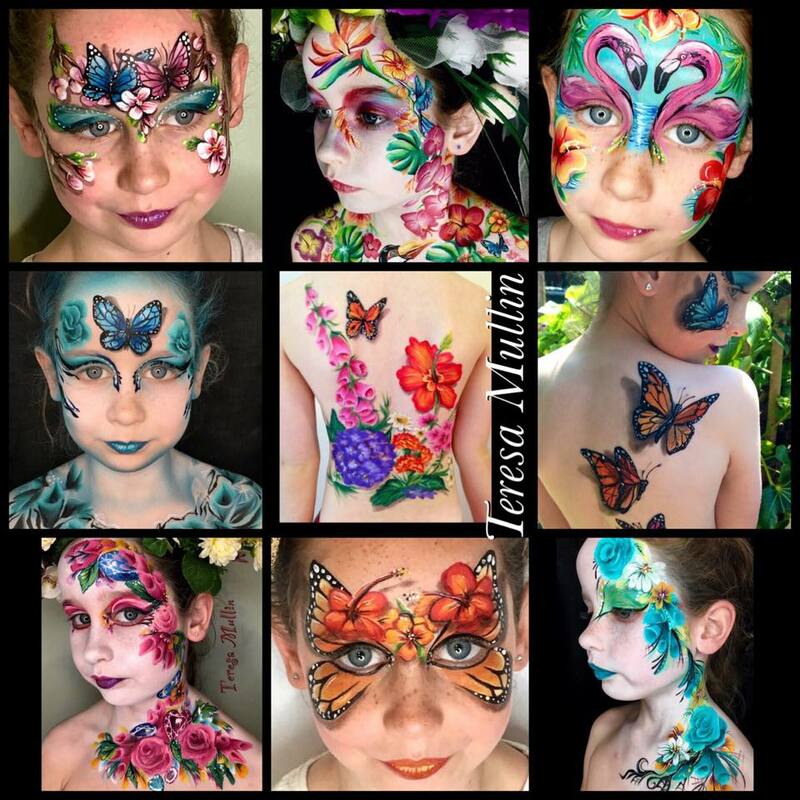 Marcela Murad was my first teacher and has been sharing her love of art for decades. 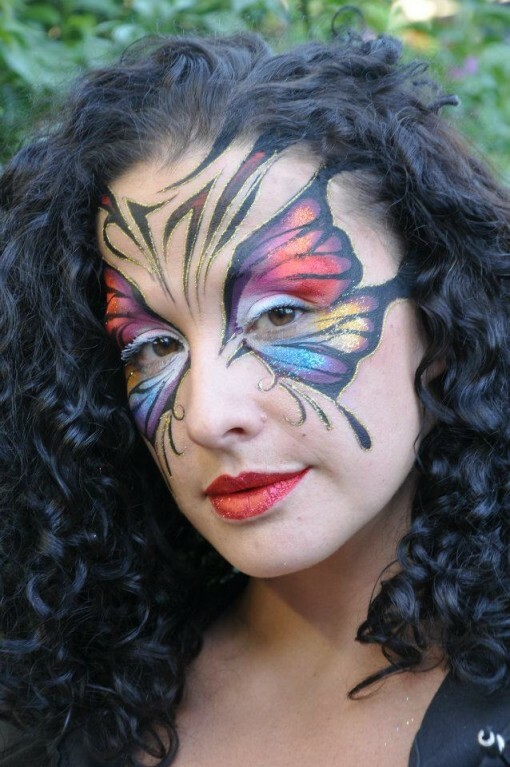 She published a book called the Book of Butterflies and it has sold 25,000 copies worldwide. 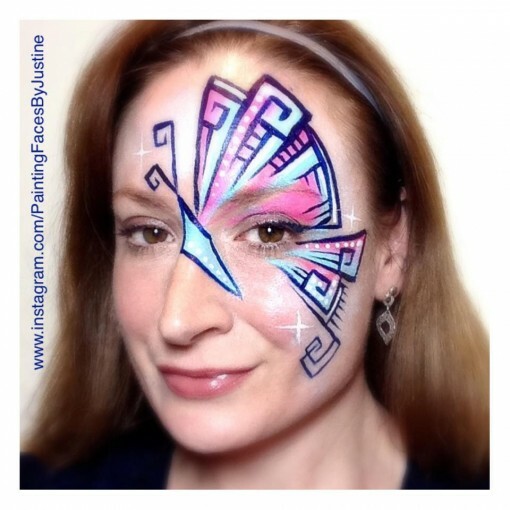 Face Your Fantasy combines bold lines with beautiful colors = a recipe for amazing! 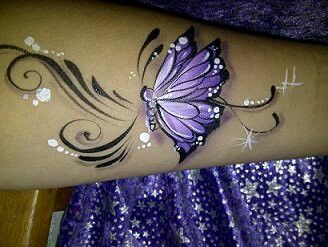 One stroke perfection by Laura Oliver. 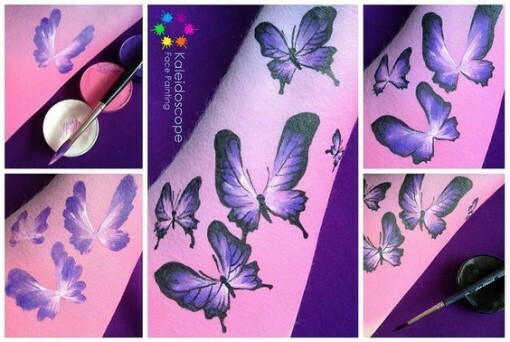 The beautiful blend and gorgeous details make this half butterfly a dream come true. 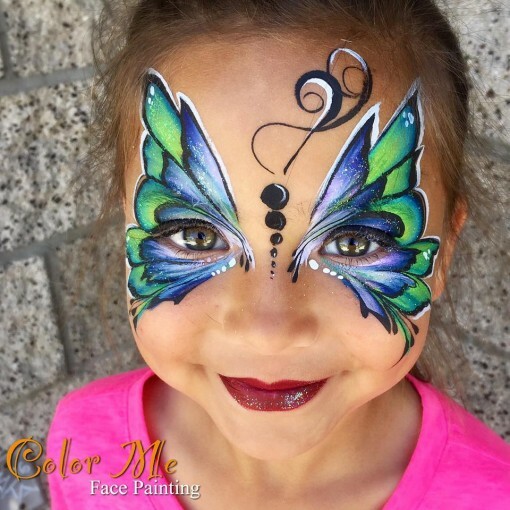 Helen of Rainbow Face & Body Art combines beautiful colors and soft lines. 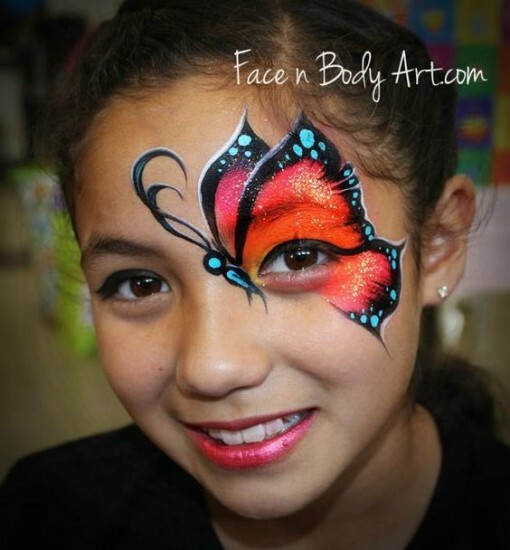 Mixing flowers and Butterflies is an instant hit! 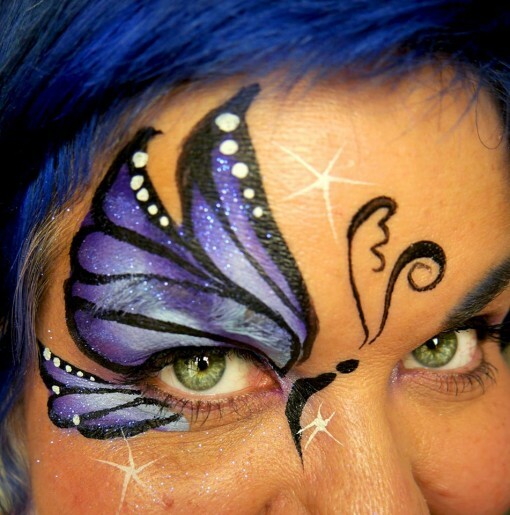 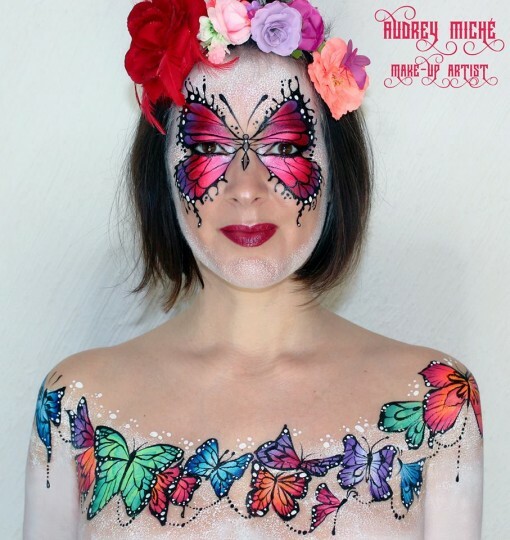 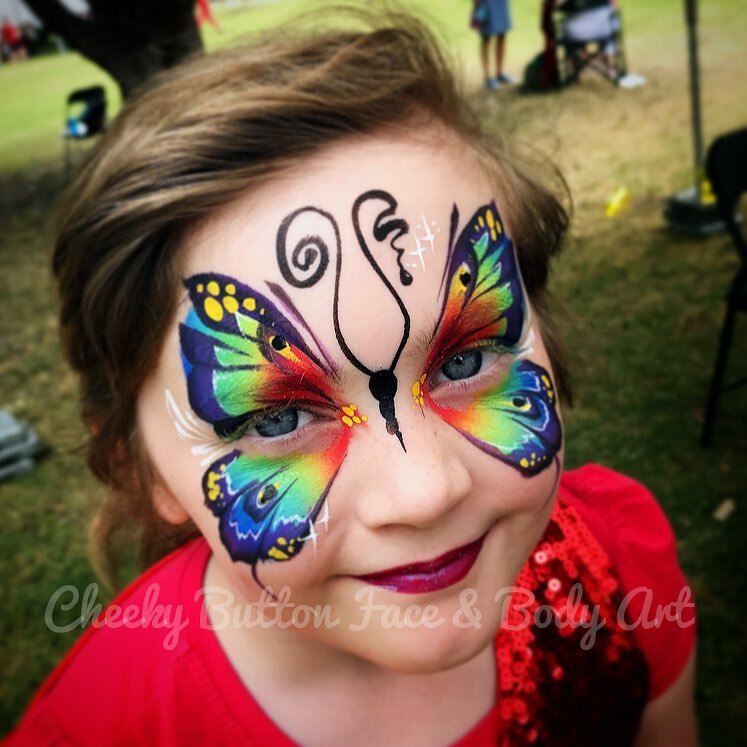 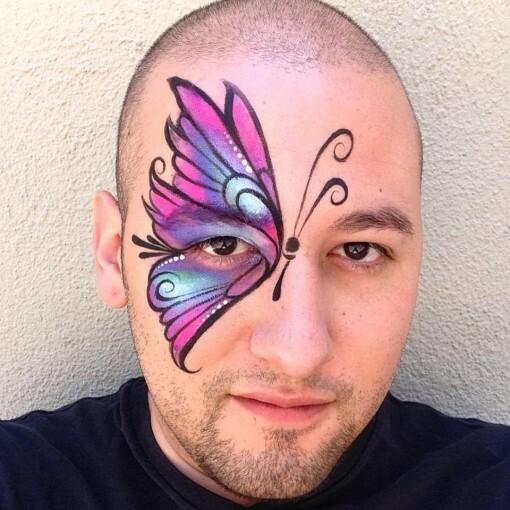 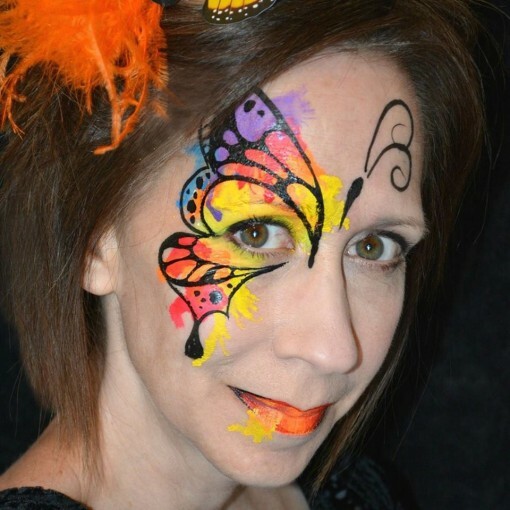 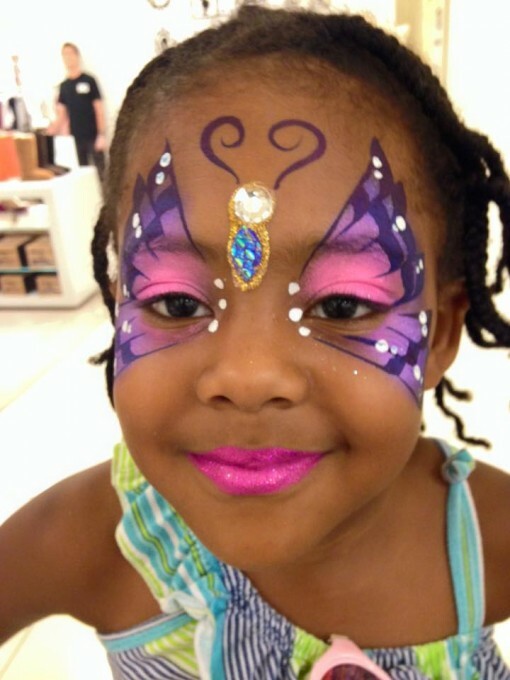 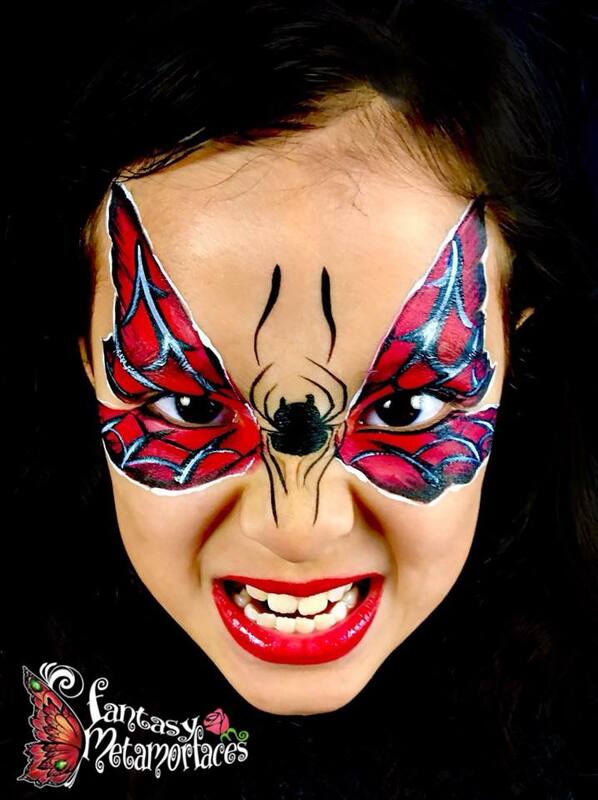 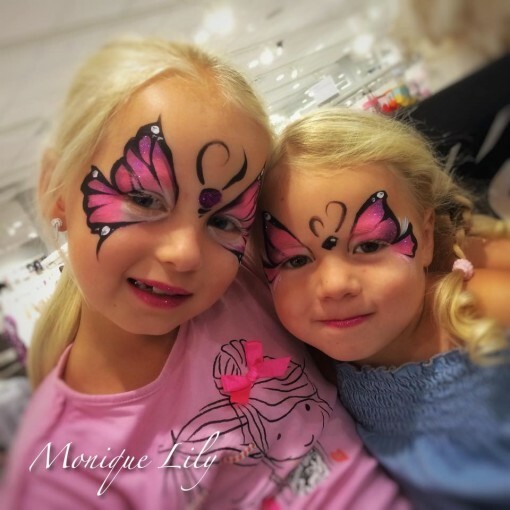 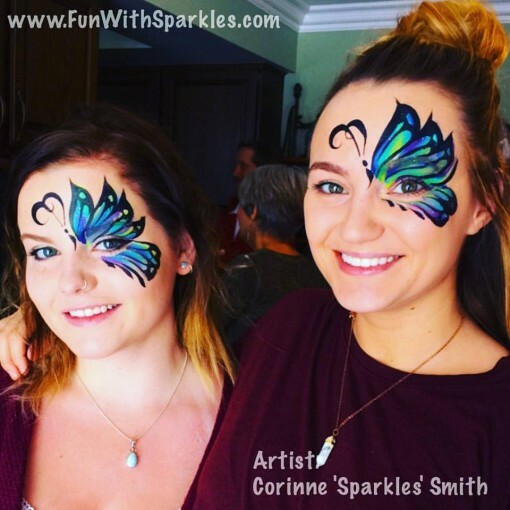 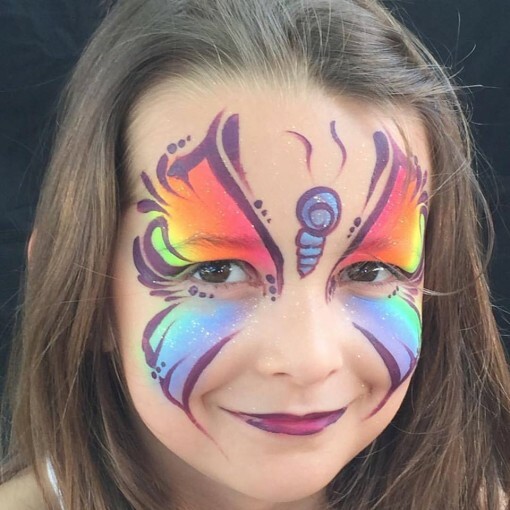 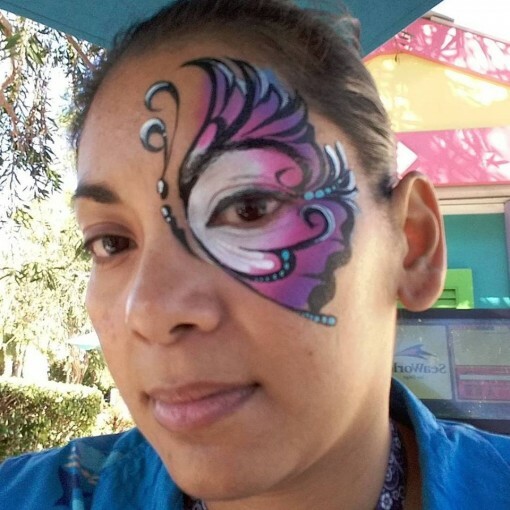 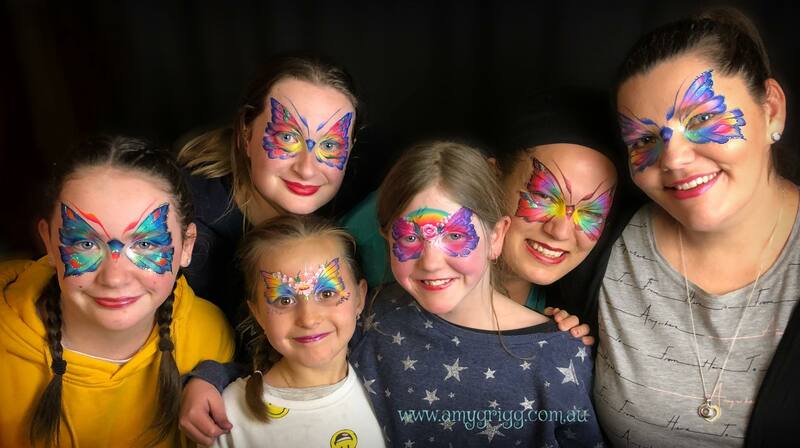 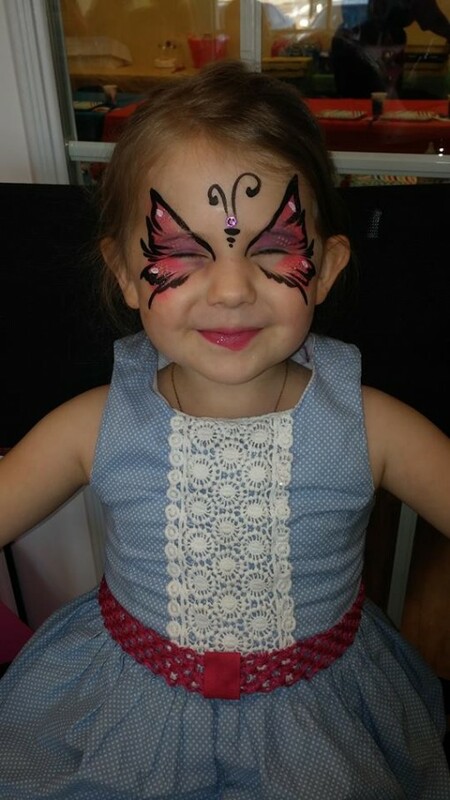 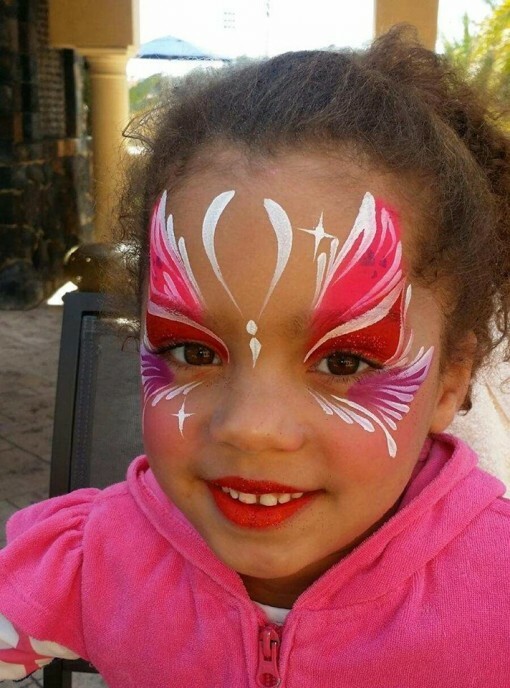 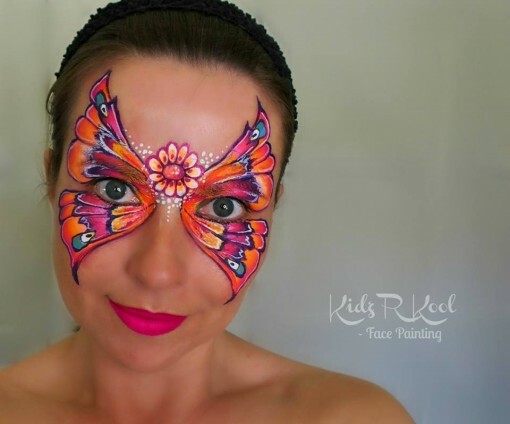 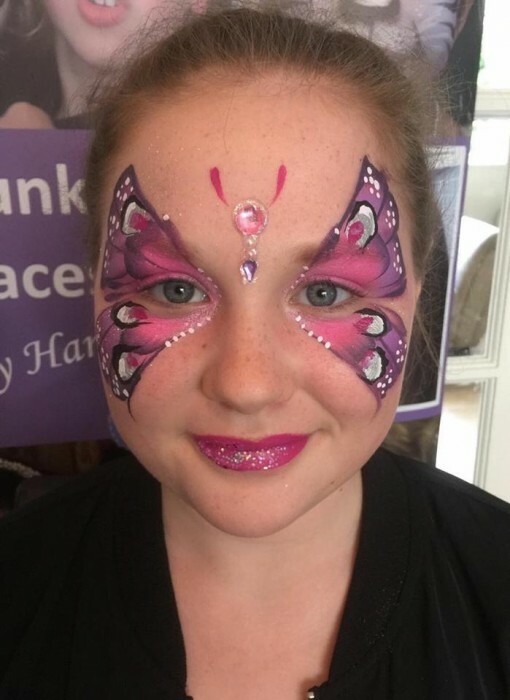 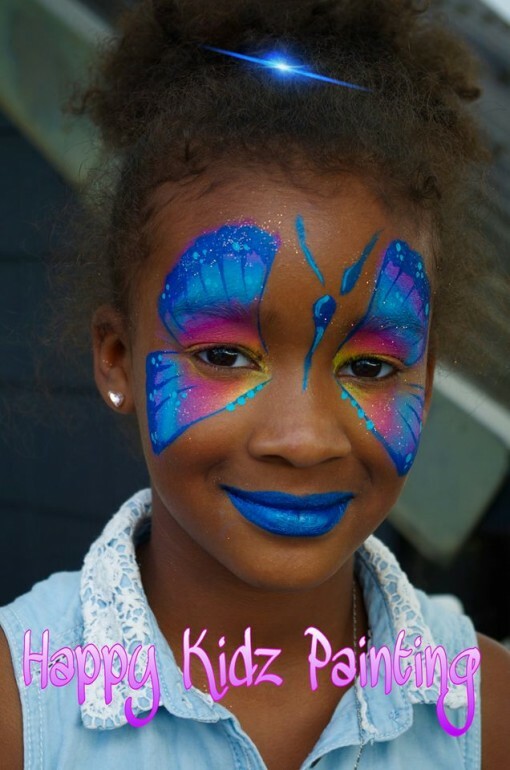 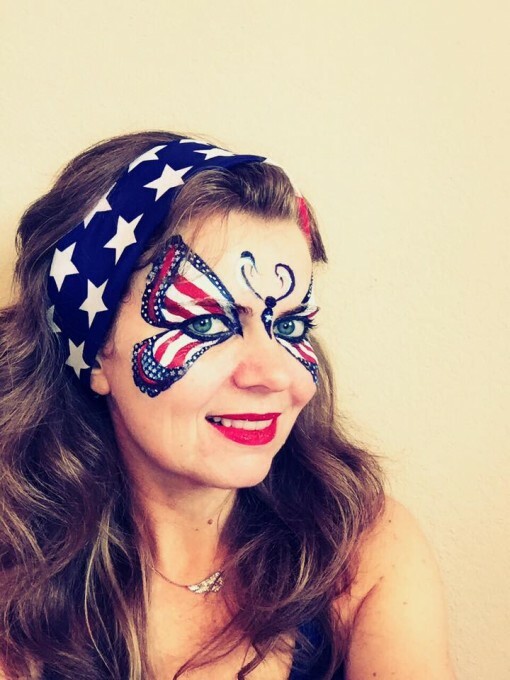 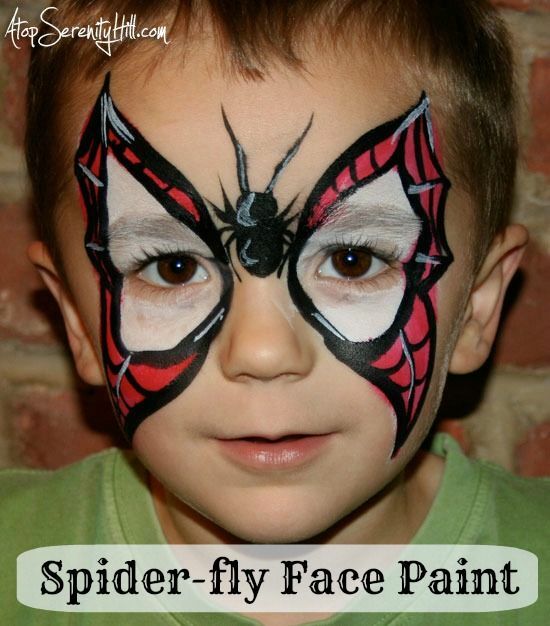 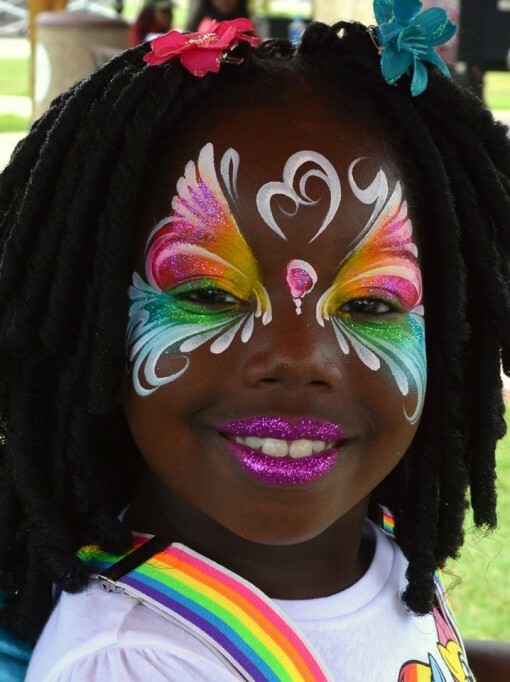 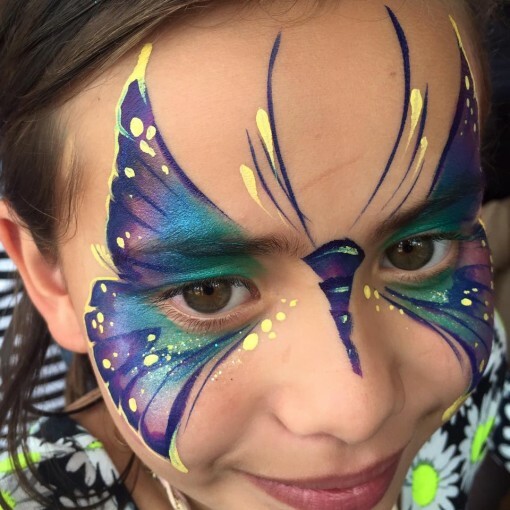 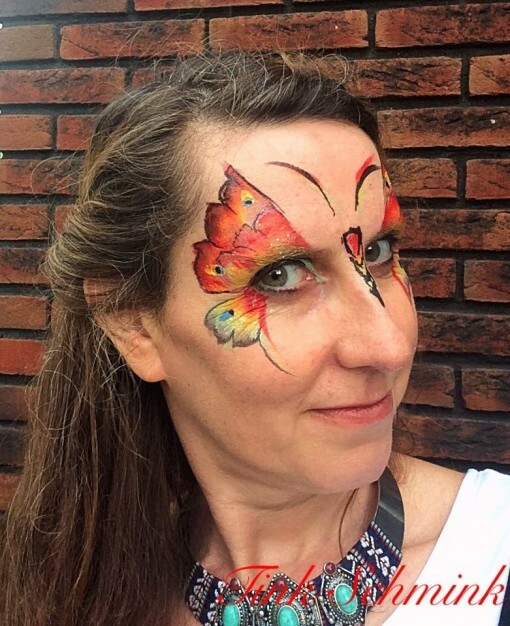 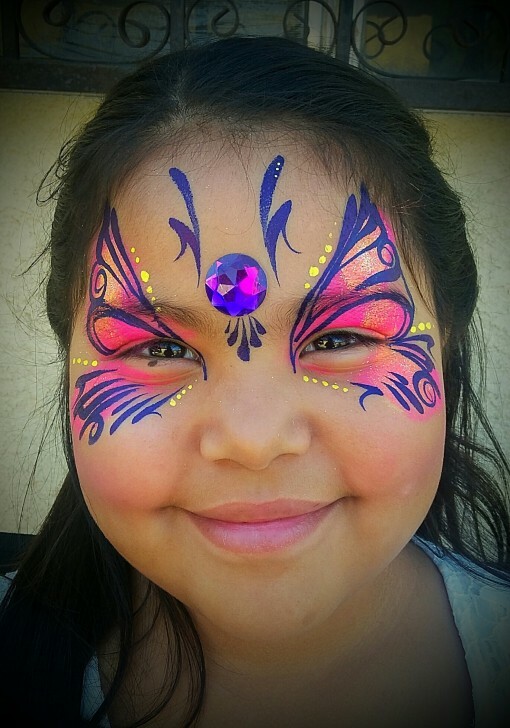 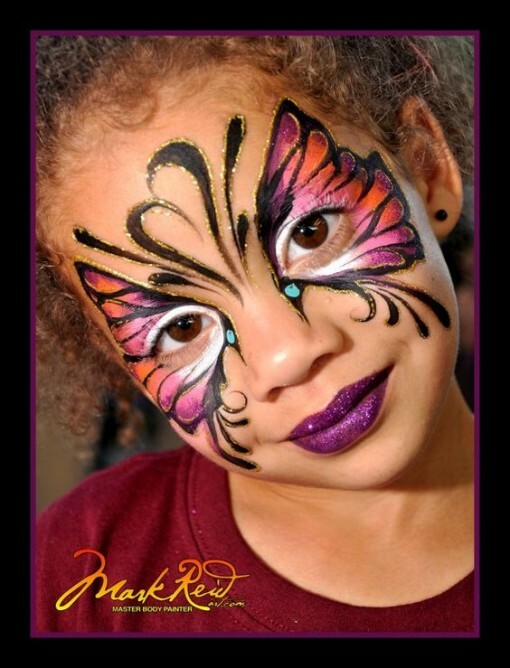 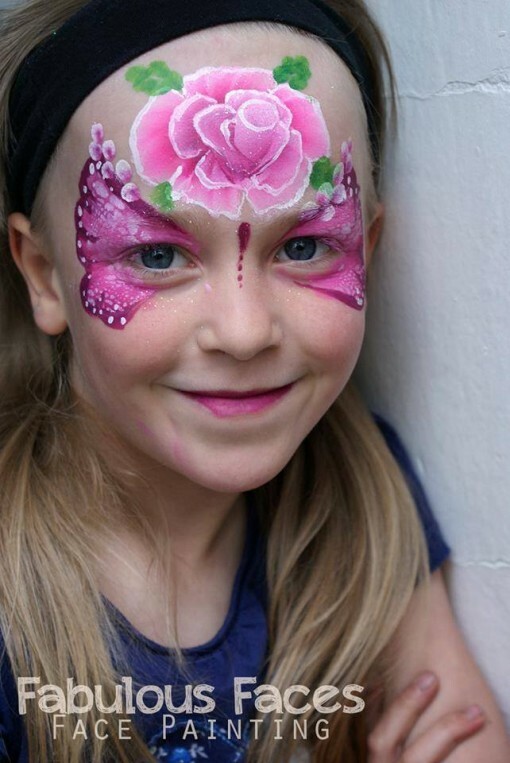 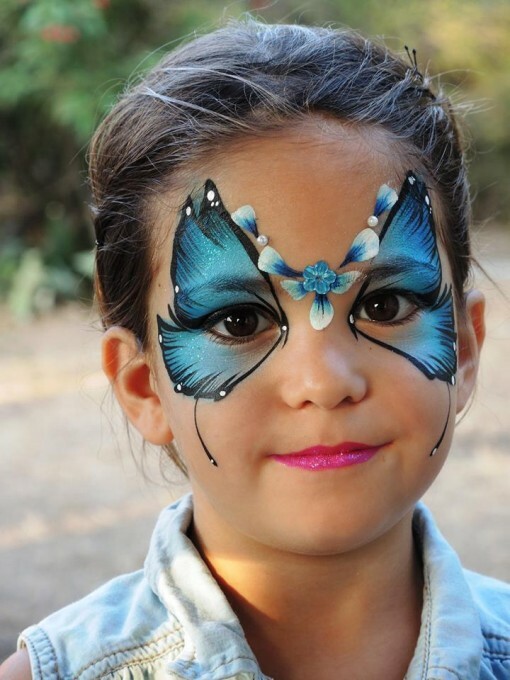 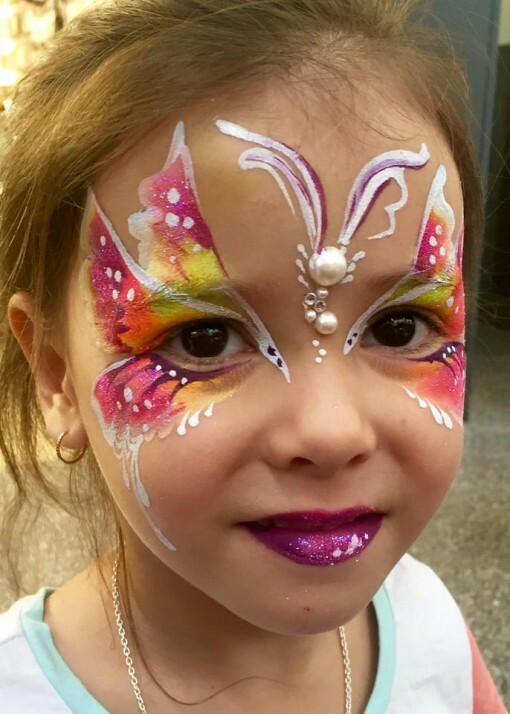 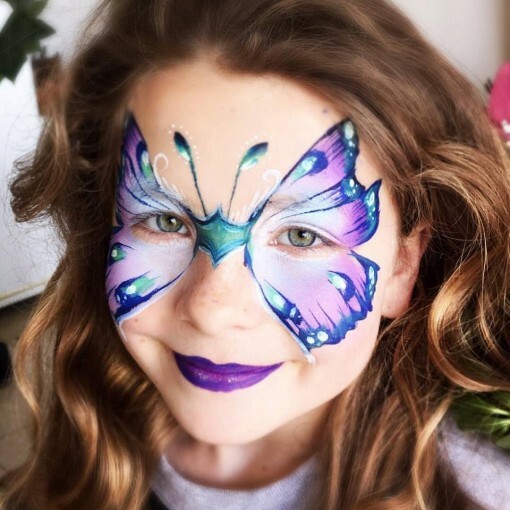 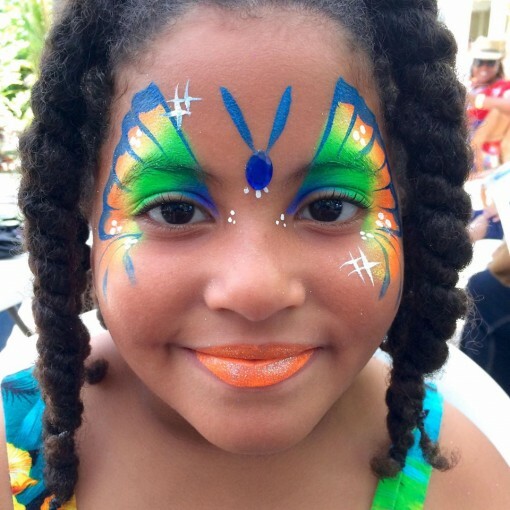 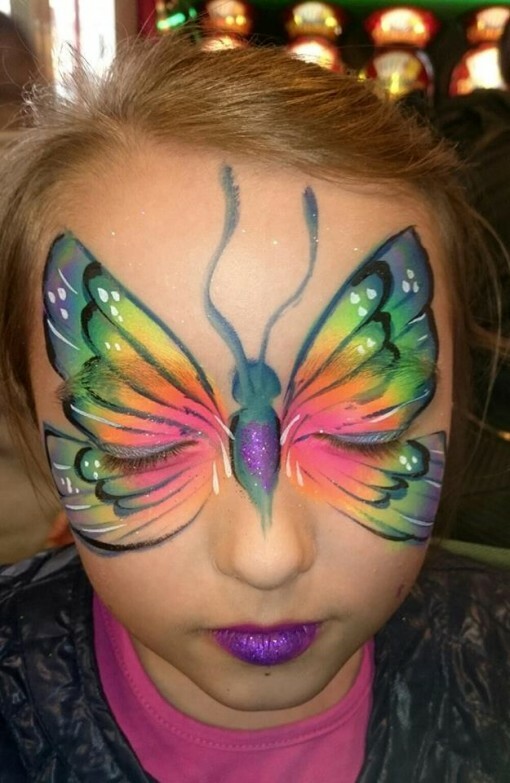 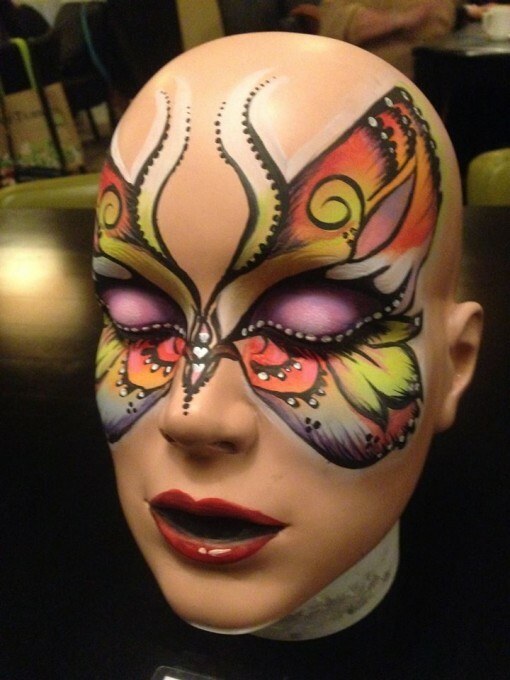 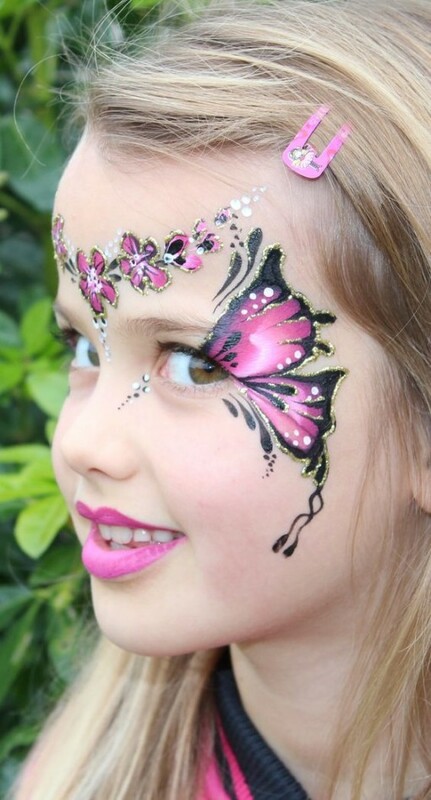 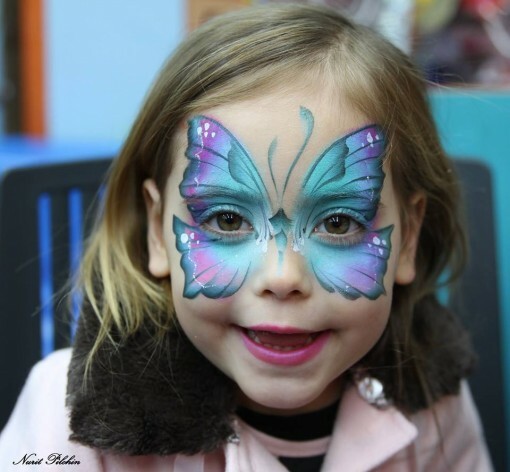 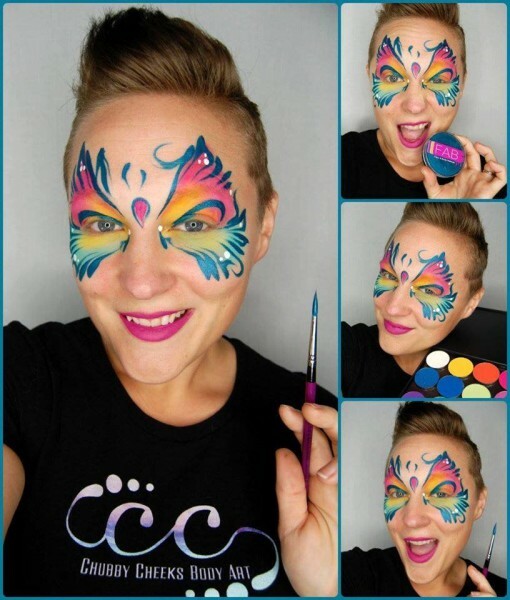 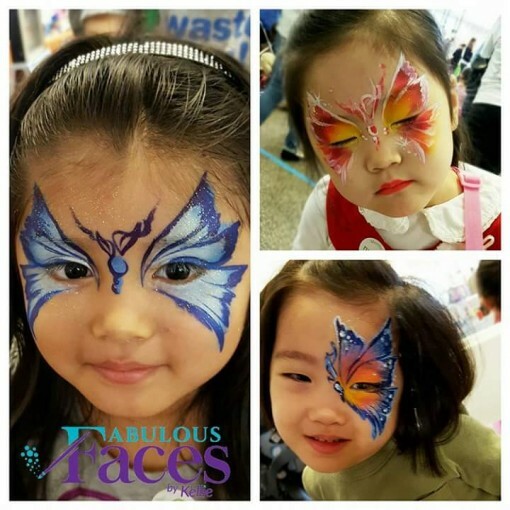 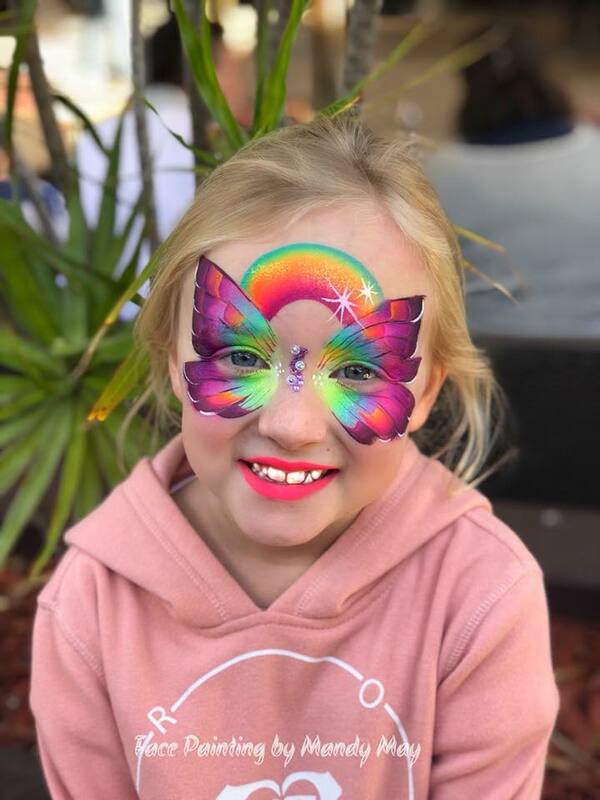 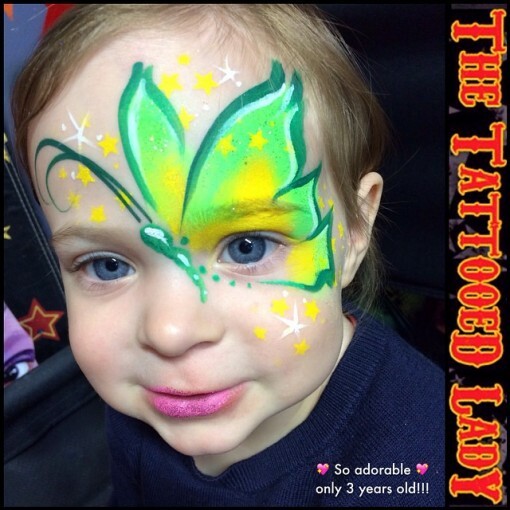 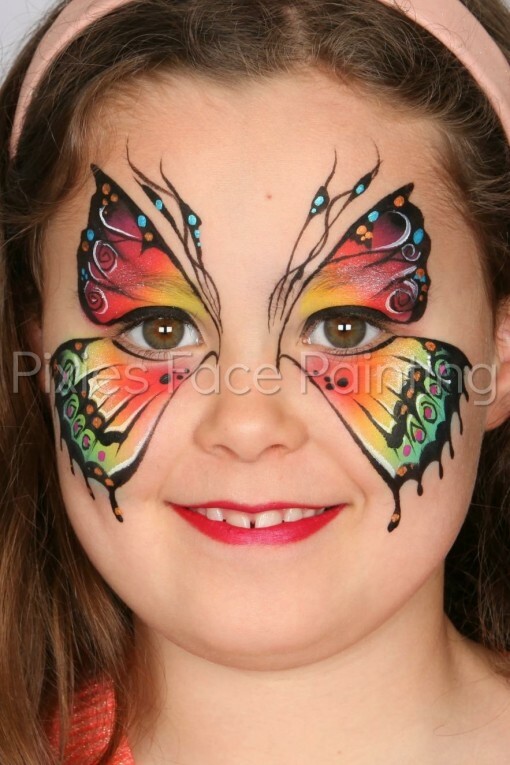 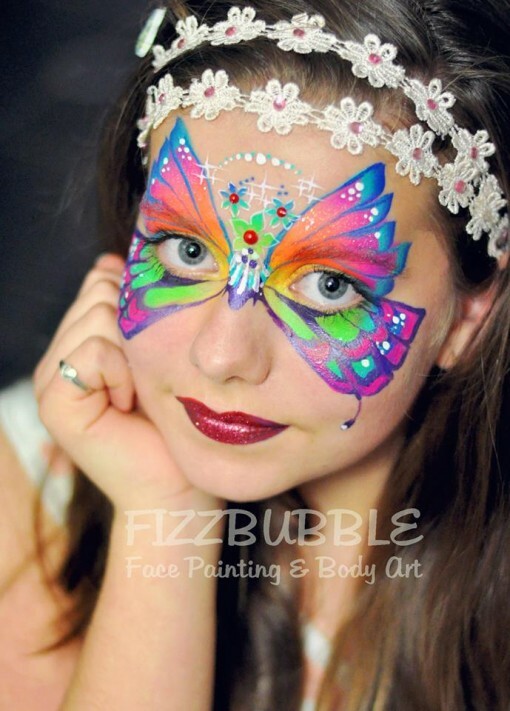 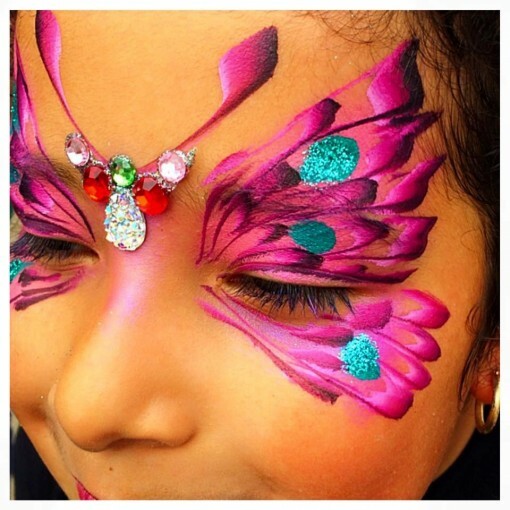 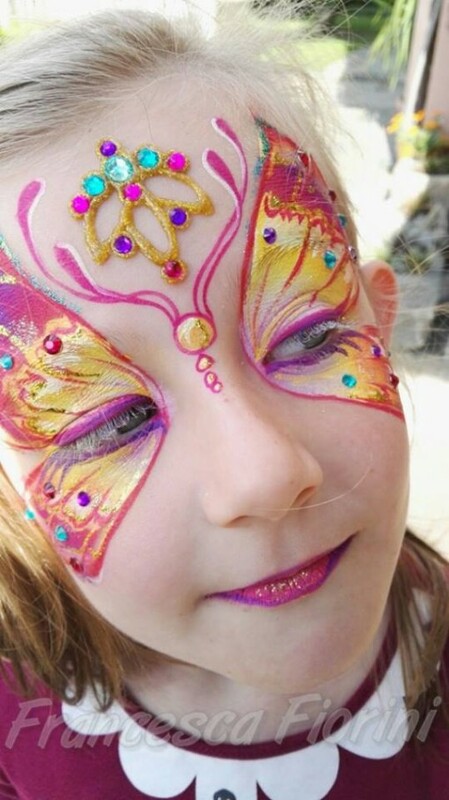 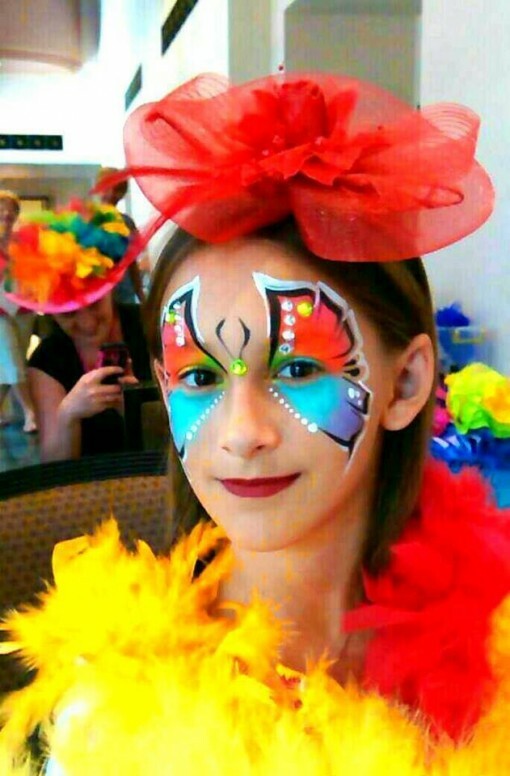 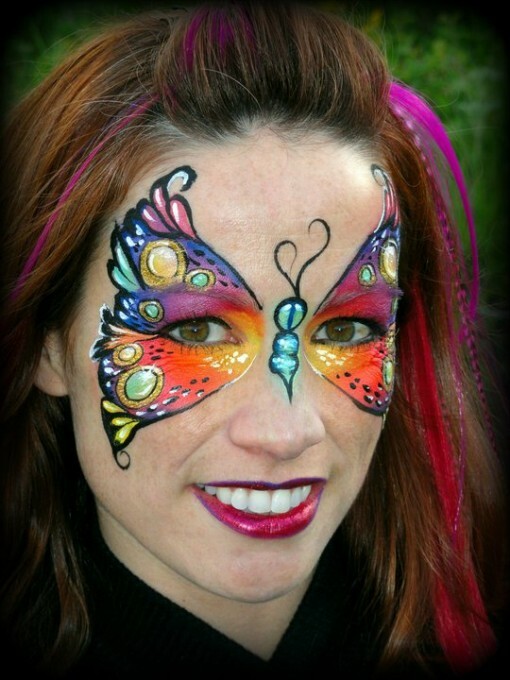 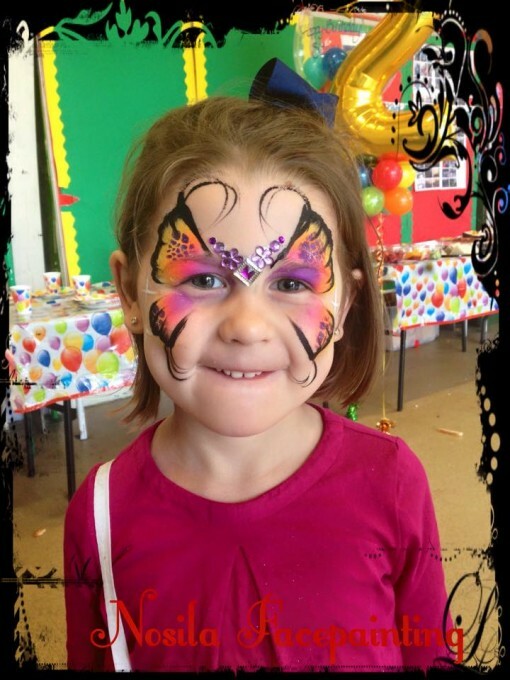 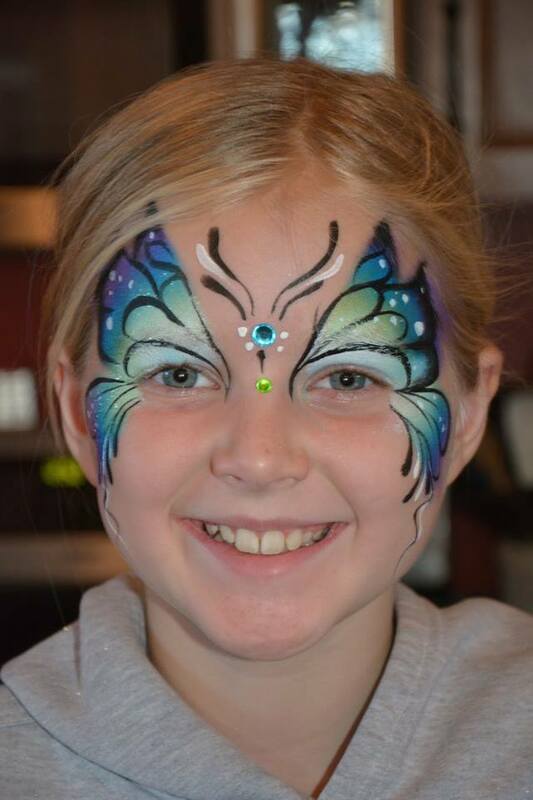 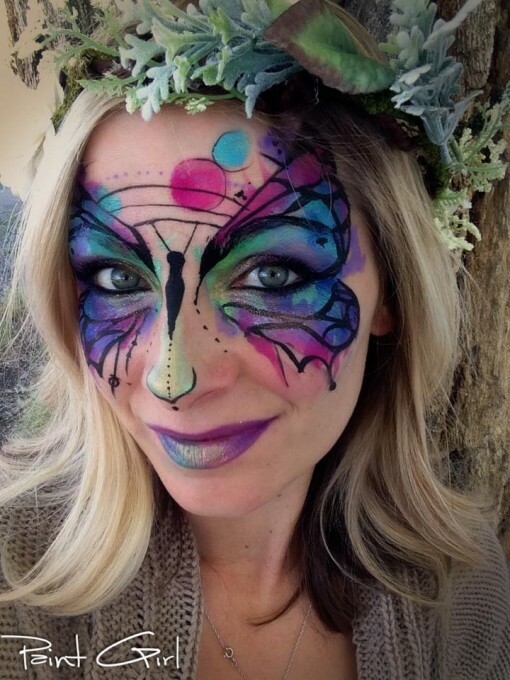 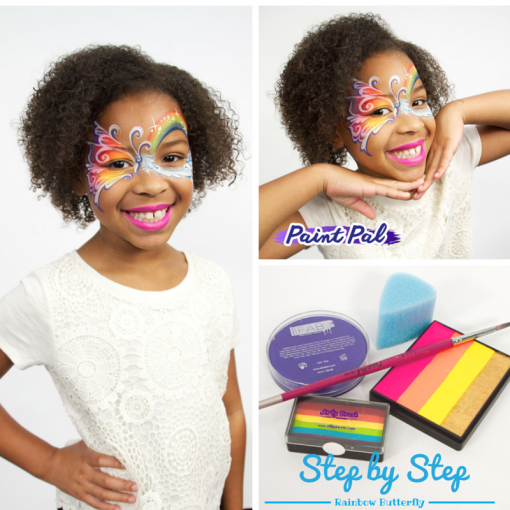 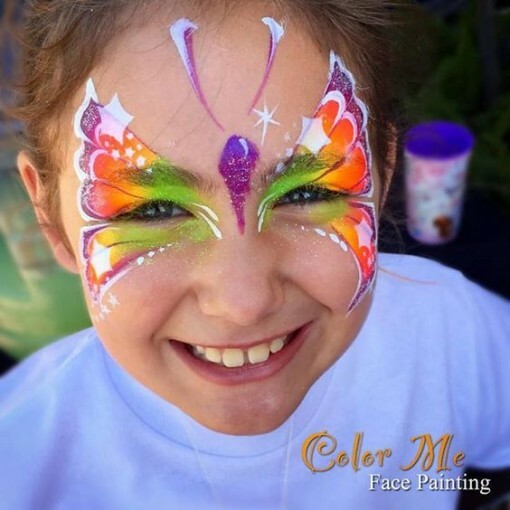 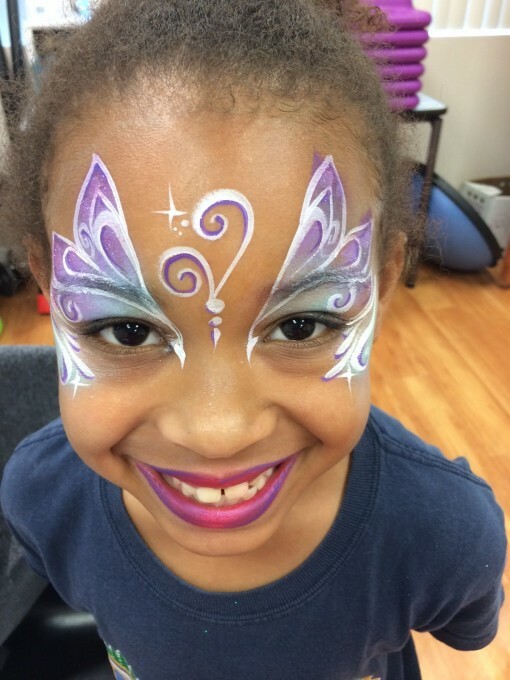 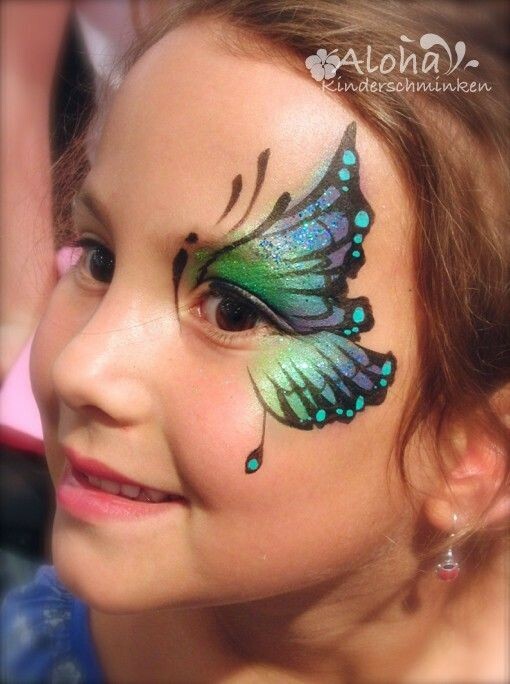 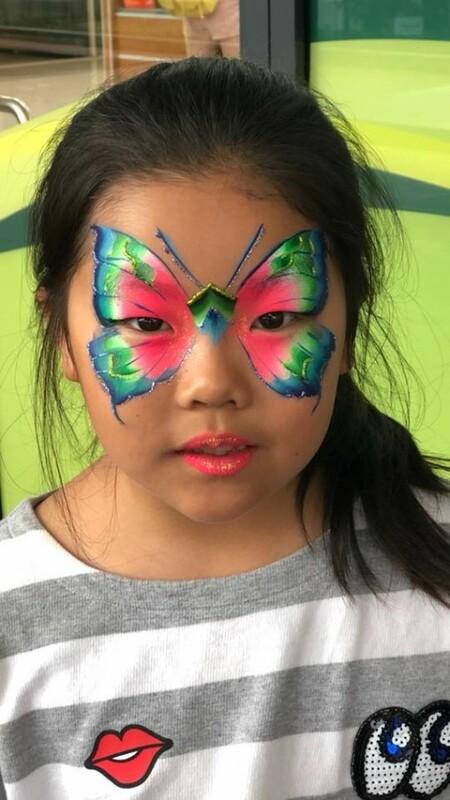 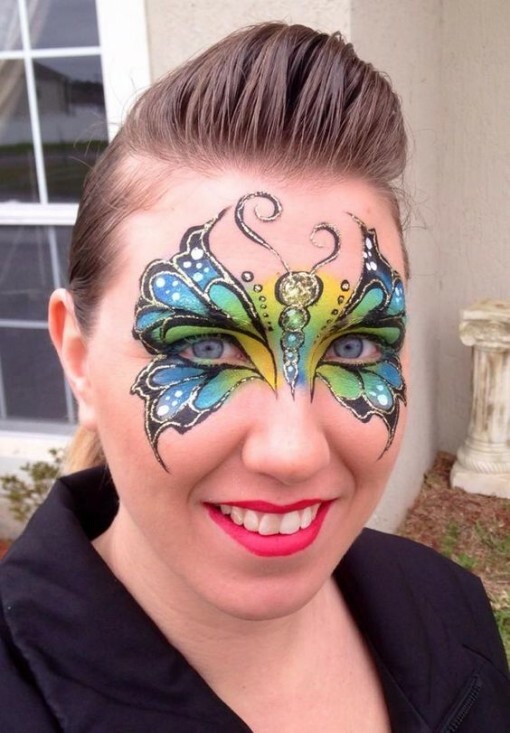 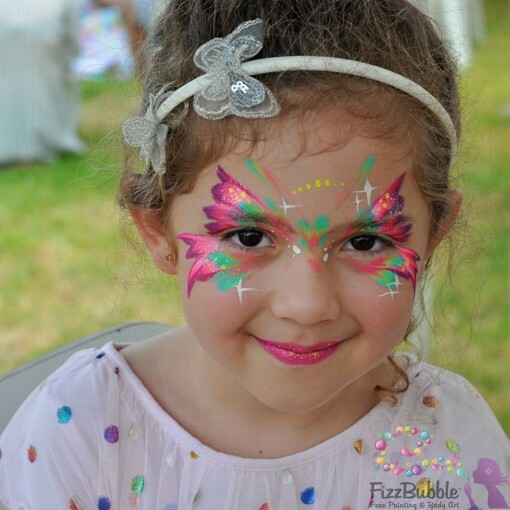 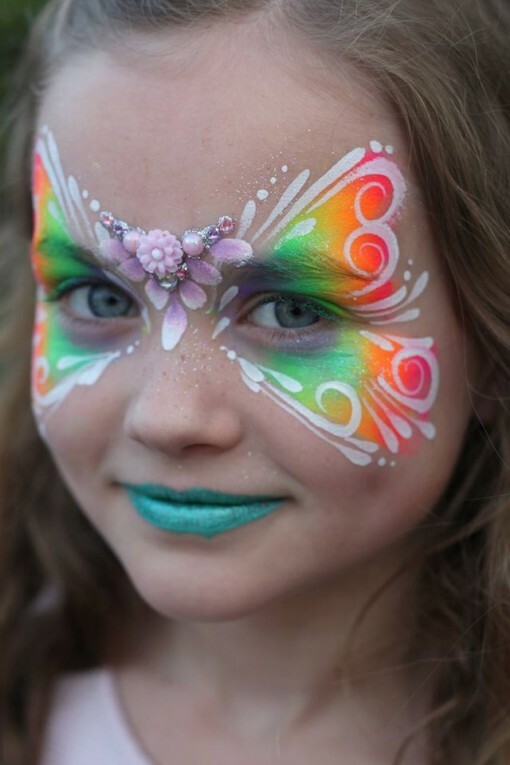 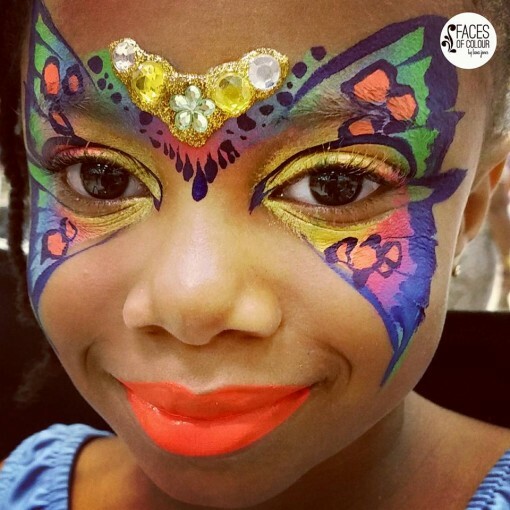 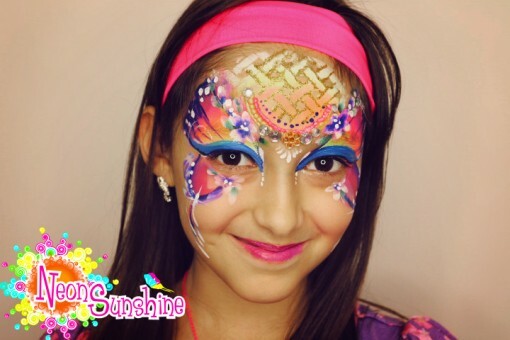 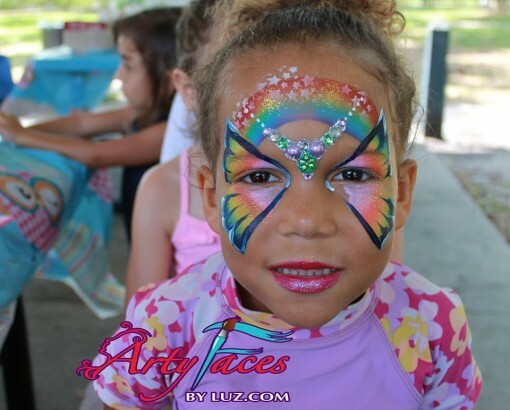 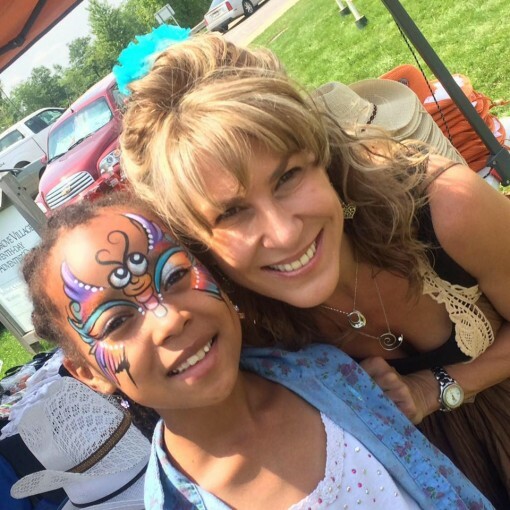 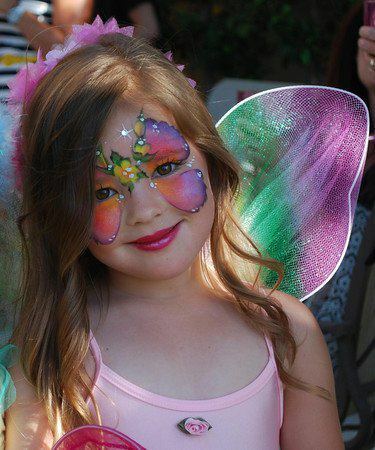 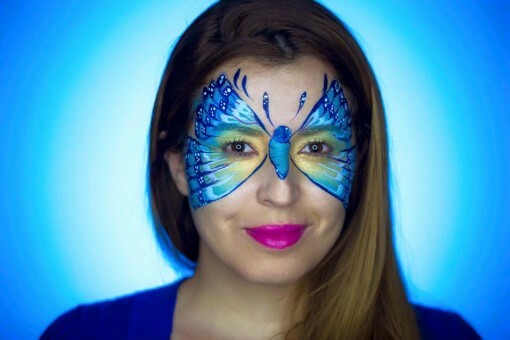 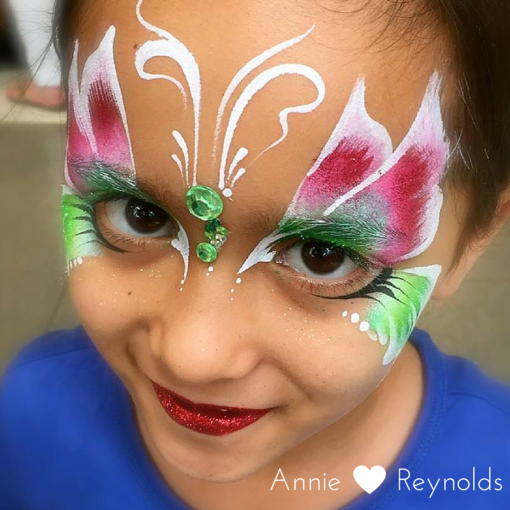 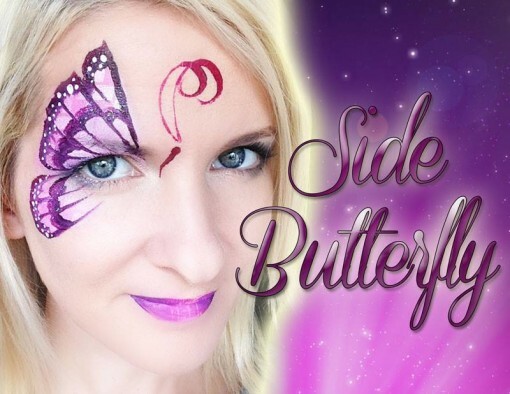 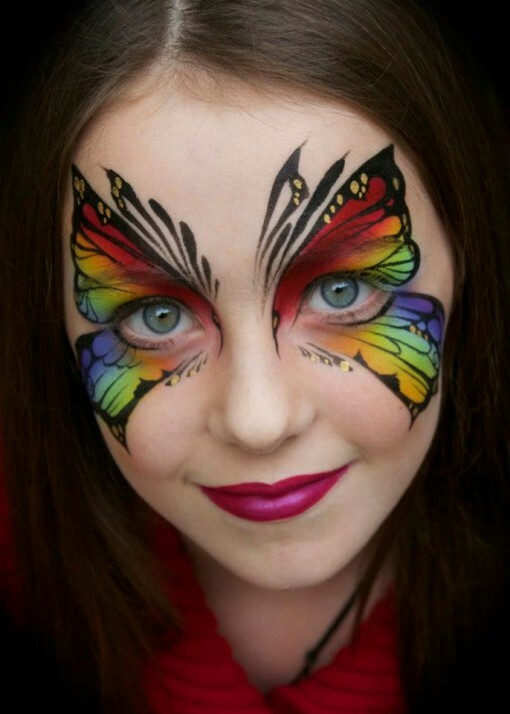 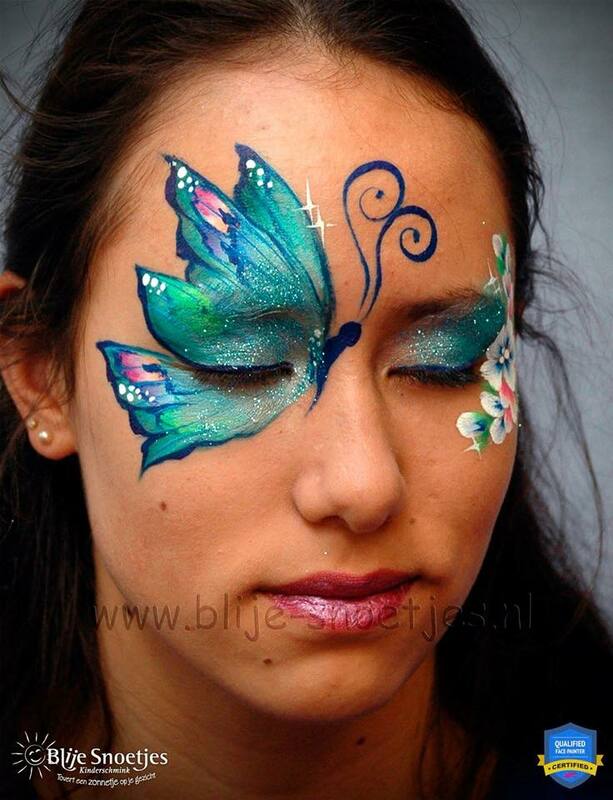 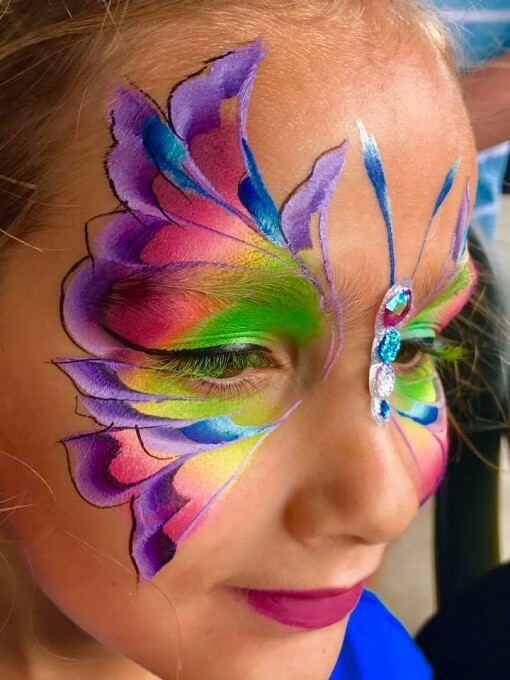 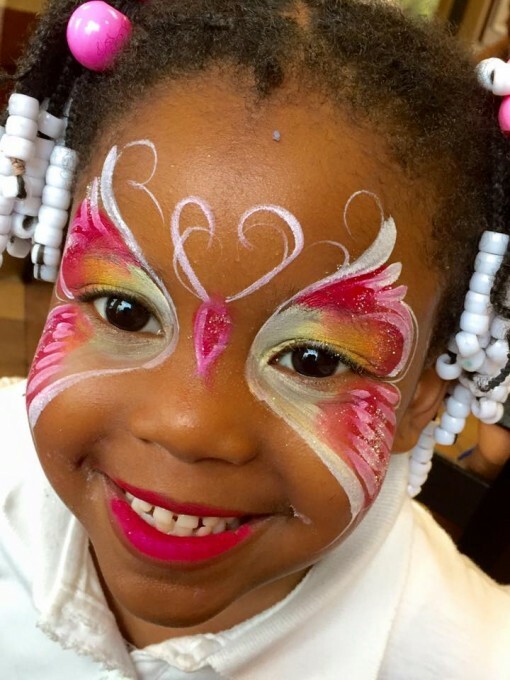 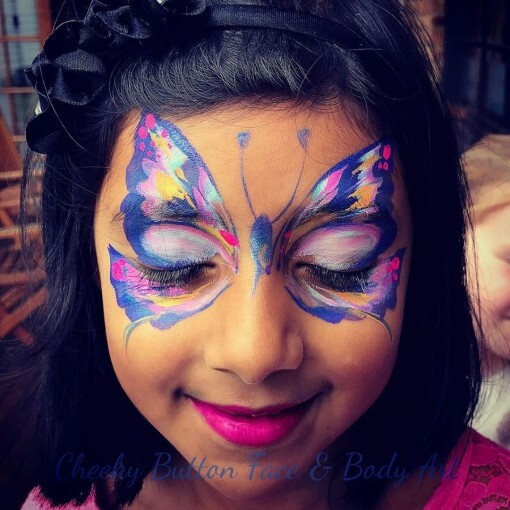 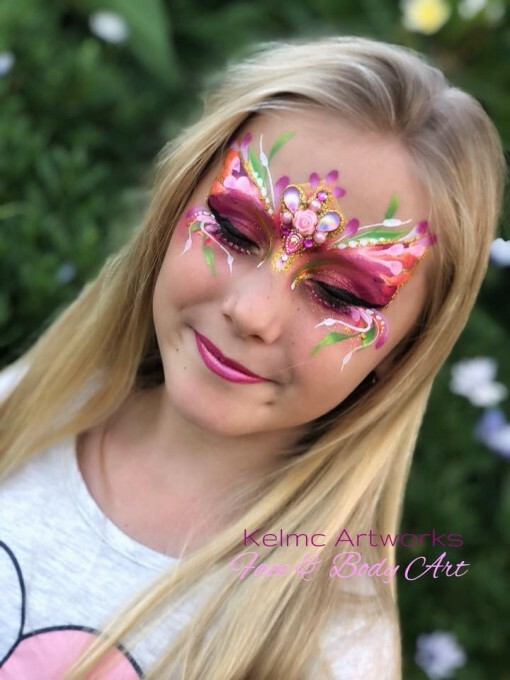 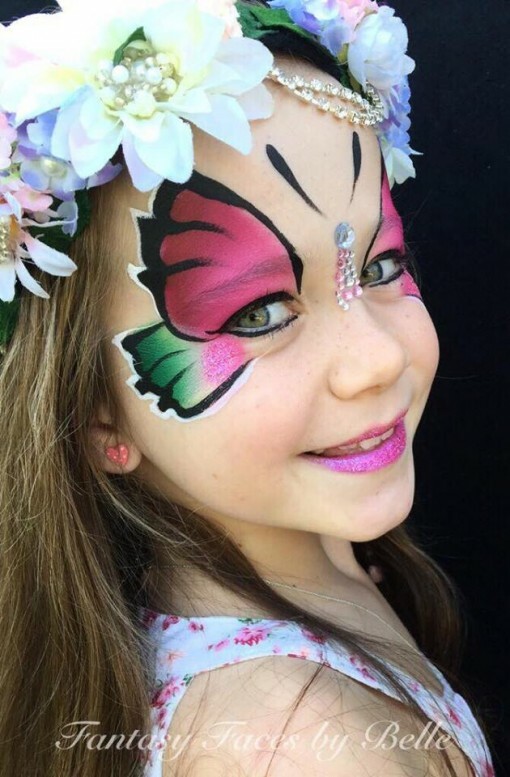 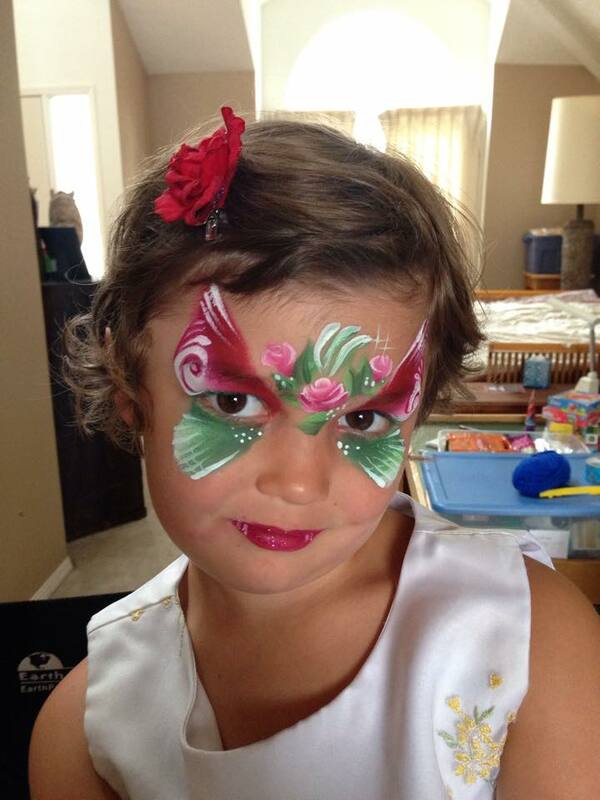 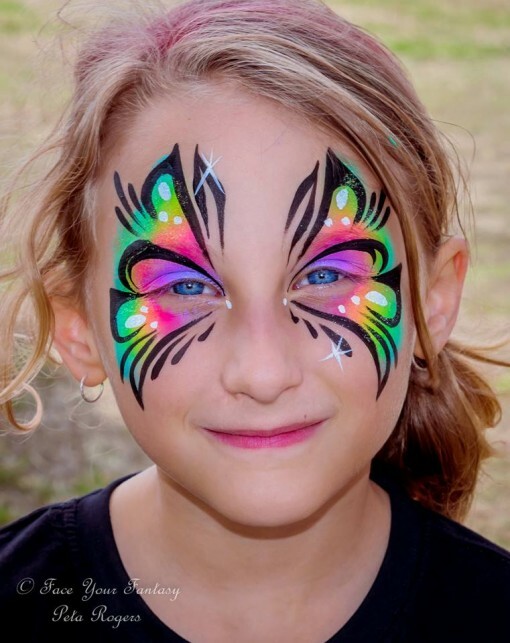 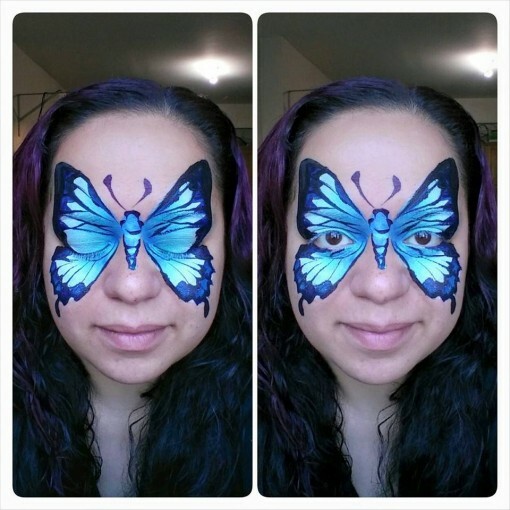 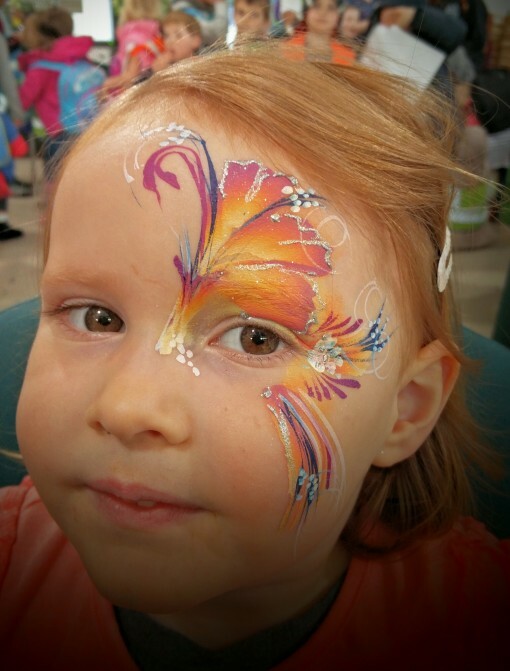 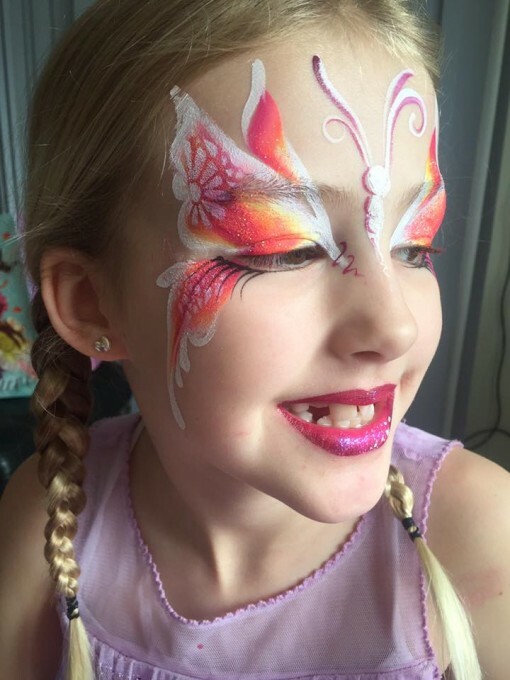 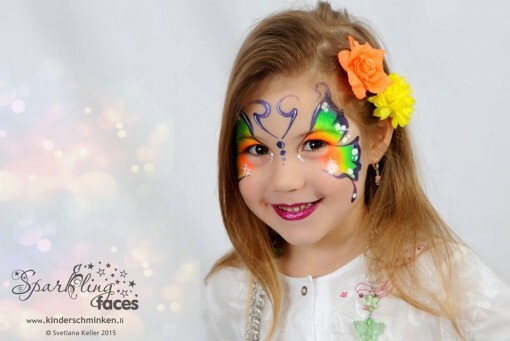 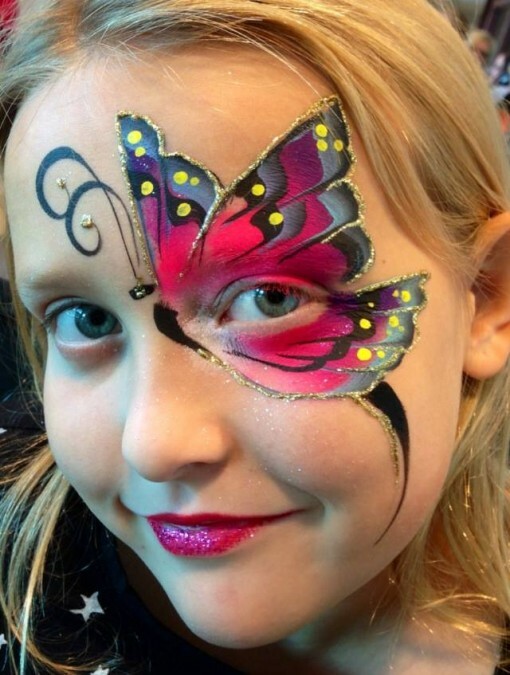 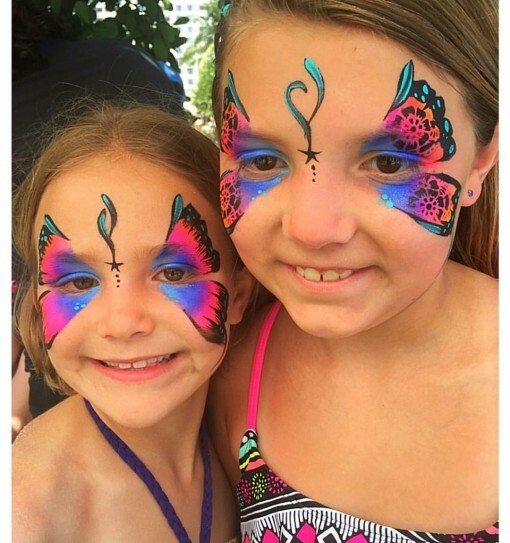 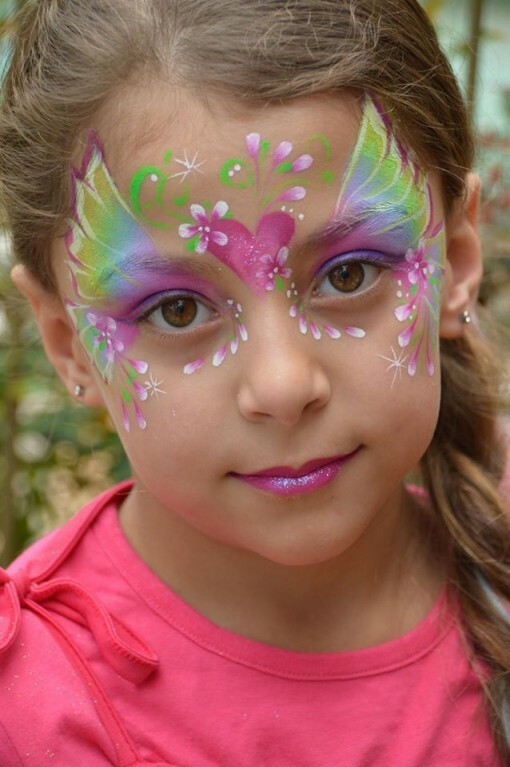 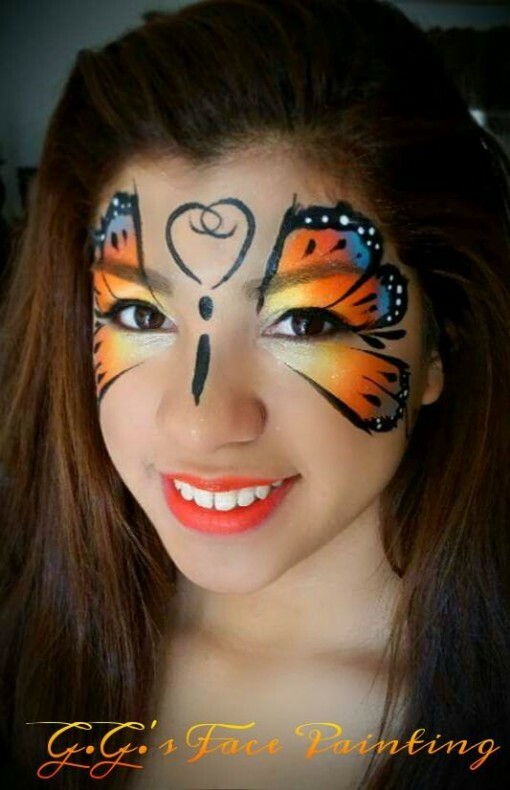 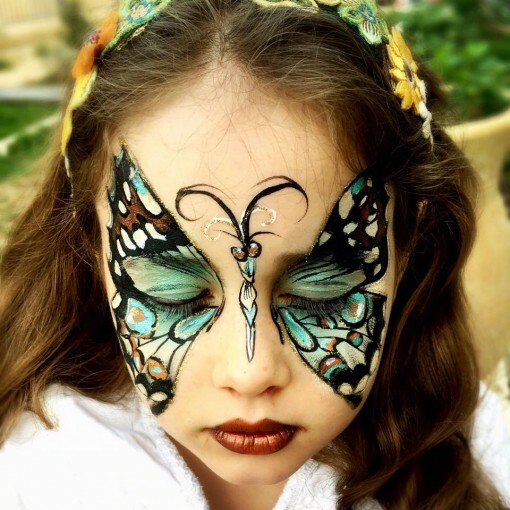 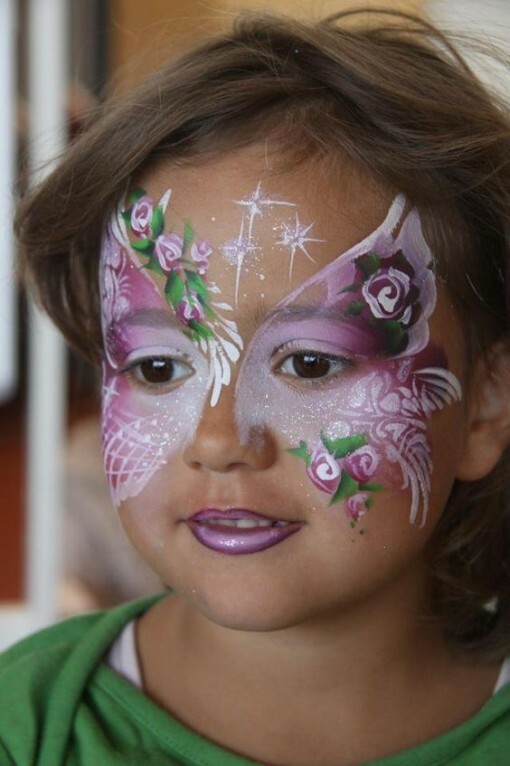 Katy Lee’s face painting page is FULL of inspiration check it out! 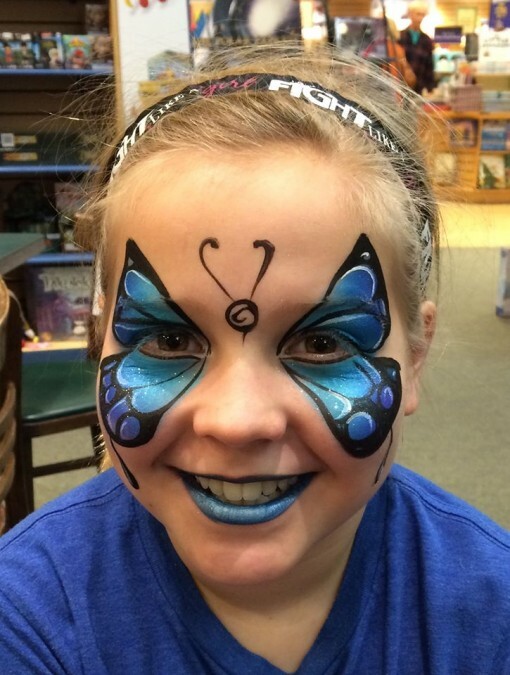 Elizabeth mixed the new Cameron Cakes with a blue outline and BAM! 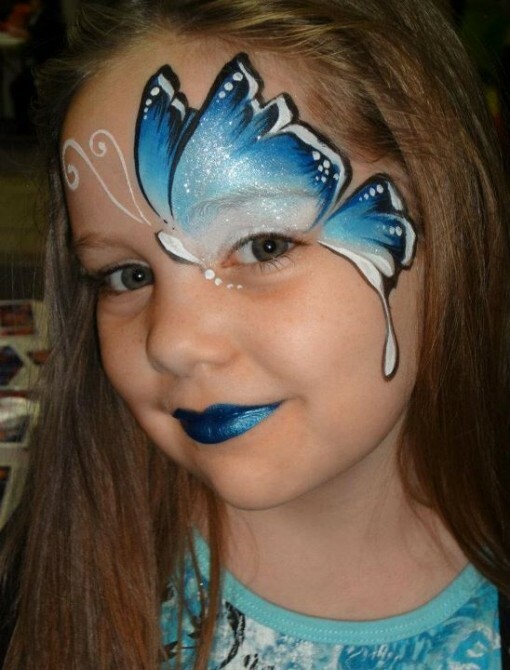 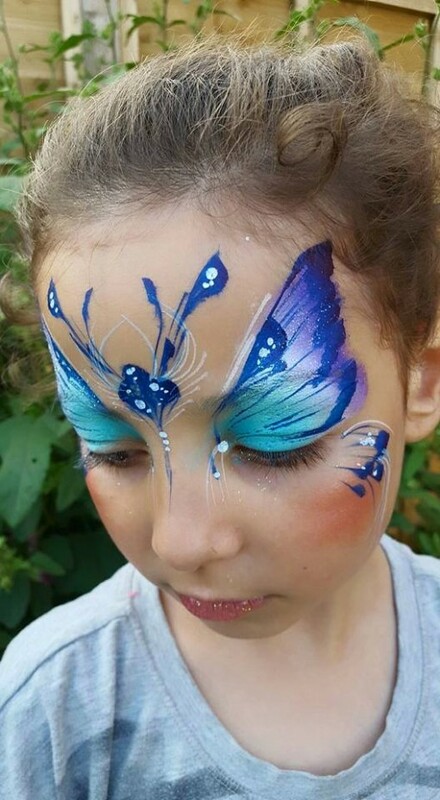 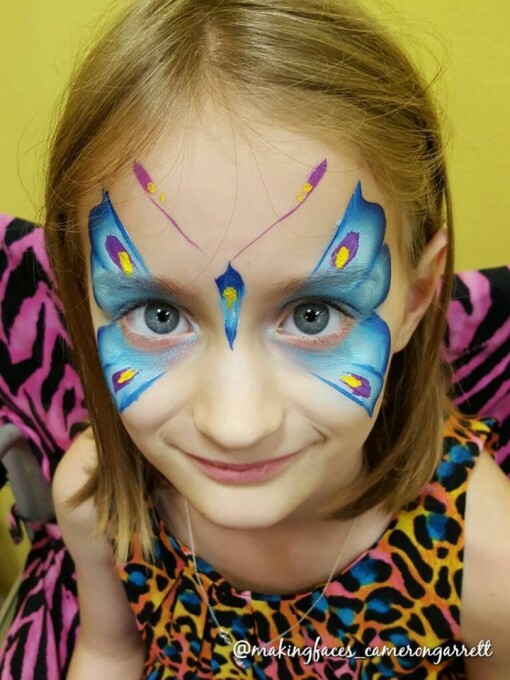 Hanka Udich from Happy Kidz shared this beautiful blue butterfly and shows how bold colors rock! 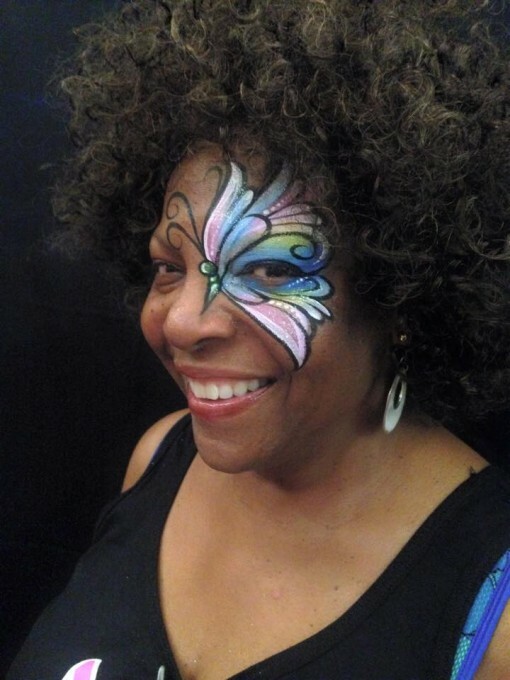 Deb Milz rosey butterfly YES!!!!!! 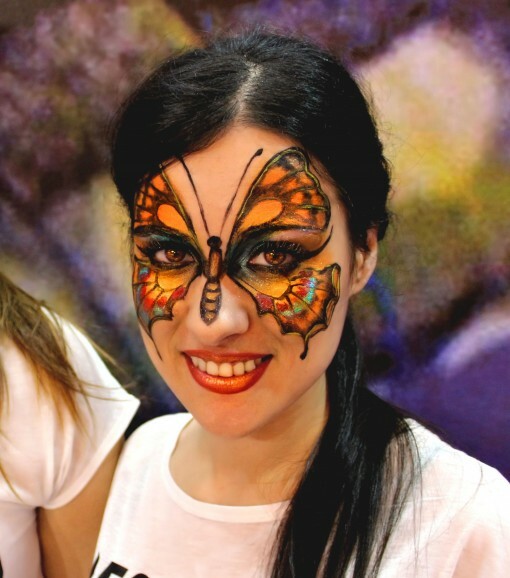 I got to meet this beauty (Gaby Renteria) at BodyCon and her painting is just a reflection of her radiance. 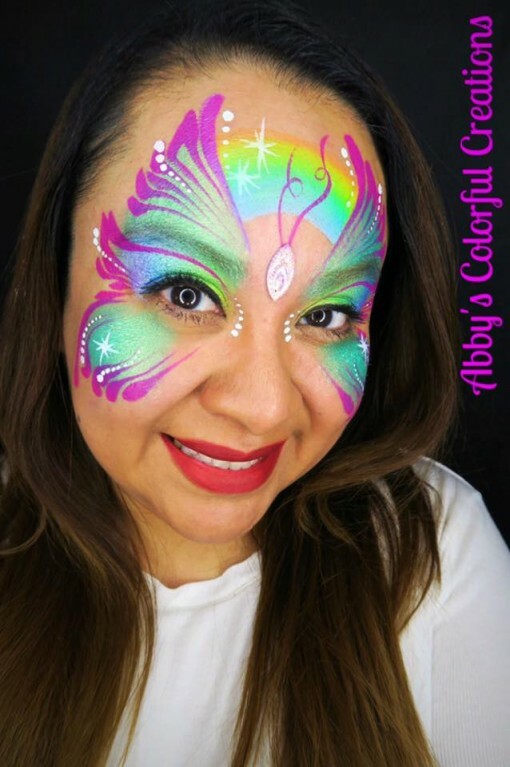 Color always wins and Irina Cruz knows it! 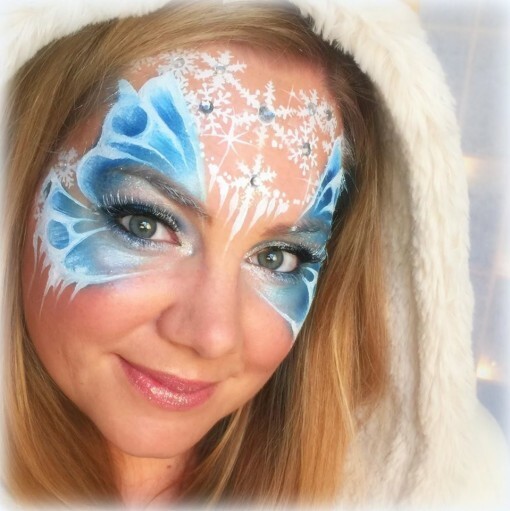 Jenny Saunders classes are still the most watched on FABAtv probably because she is amazing! 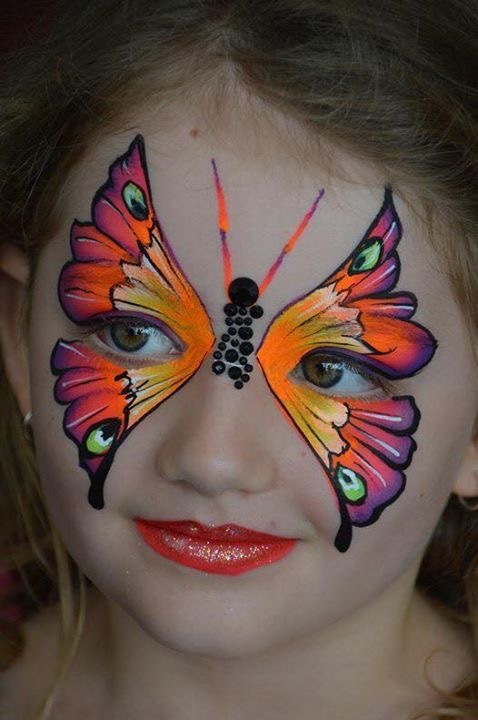 Half eye butterfly with wispies GORGEOUS! 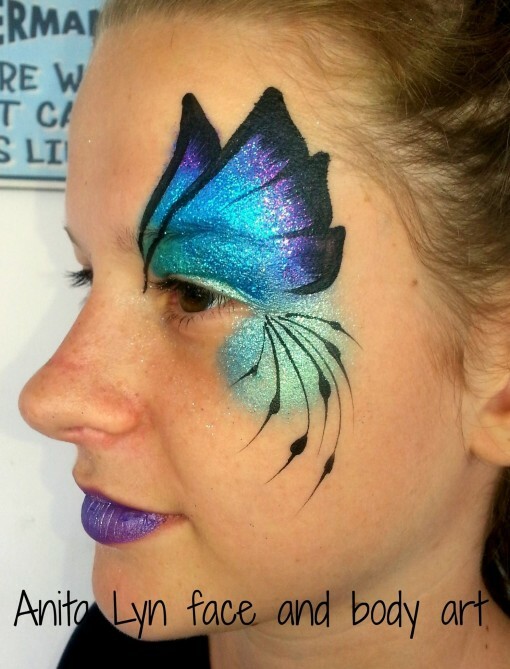 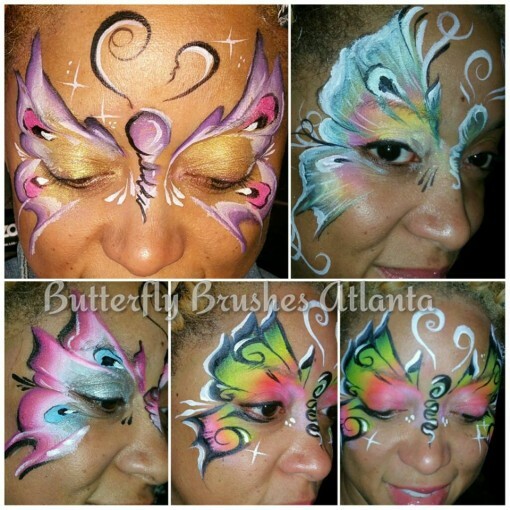 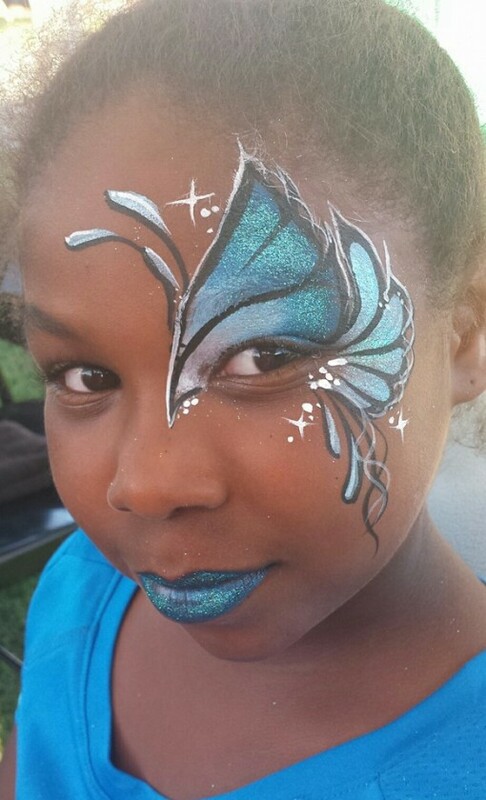 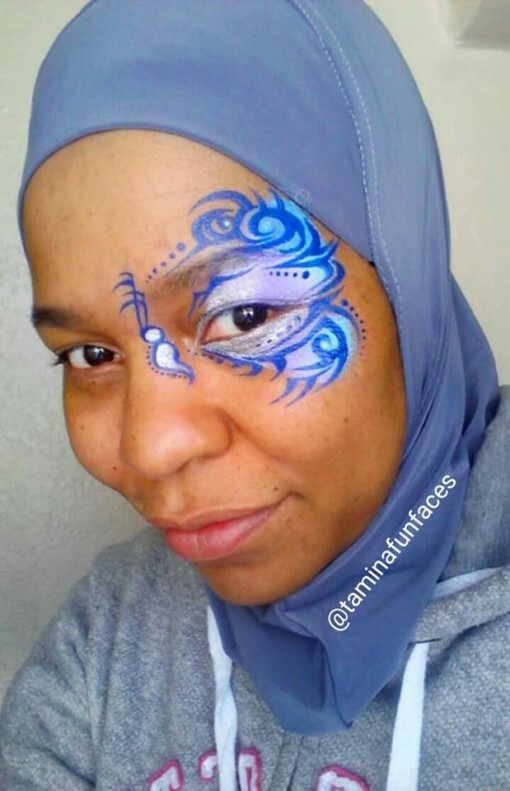 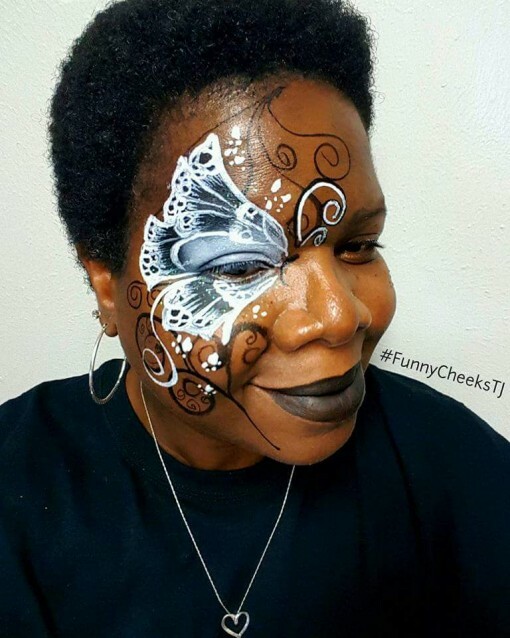 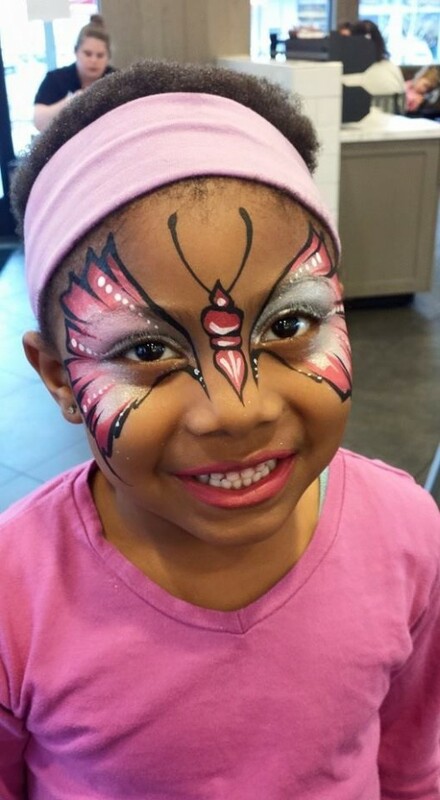 Tribal Butterfly magic by Tamina BLUE outline genius! 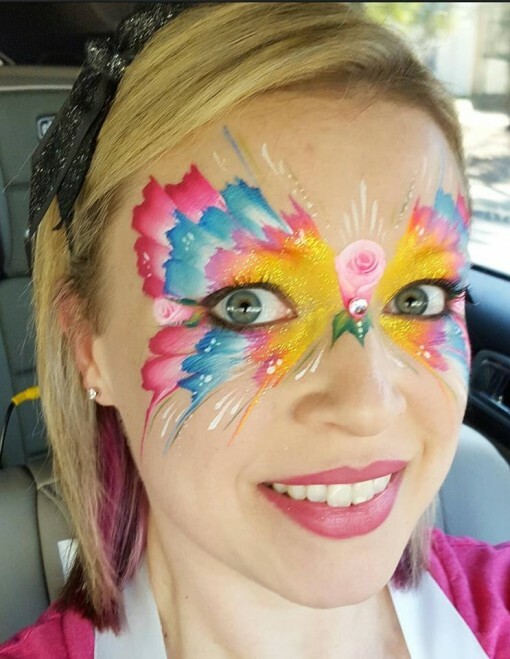 So nice I had to post her twice. 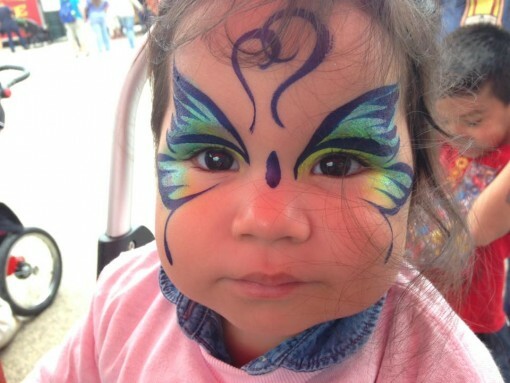 Leylah’s fav fly and ours too. 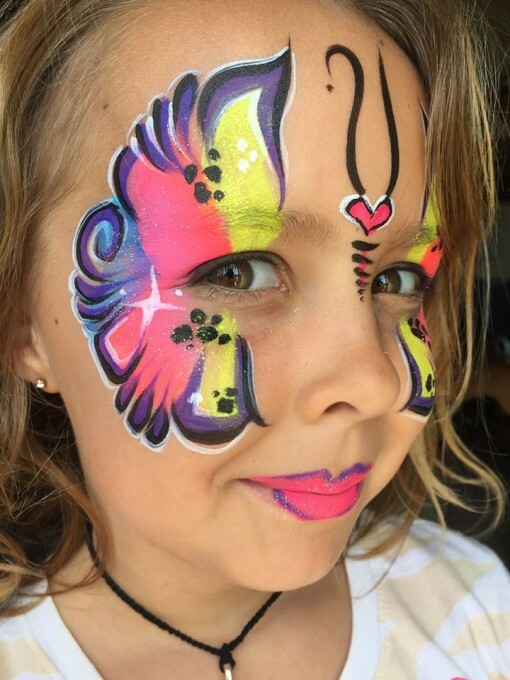 Viene of Paradise Pixie Painters reminds us that neon colors look good all year round. 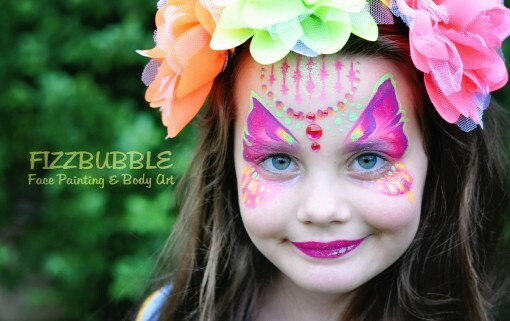 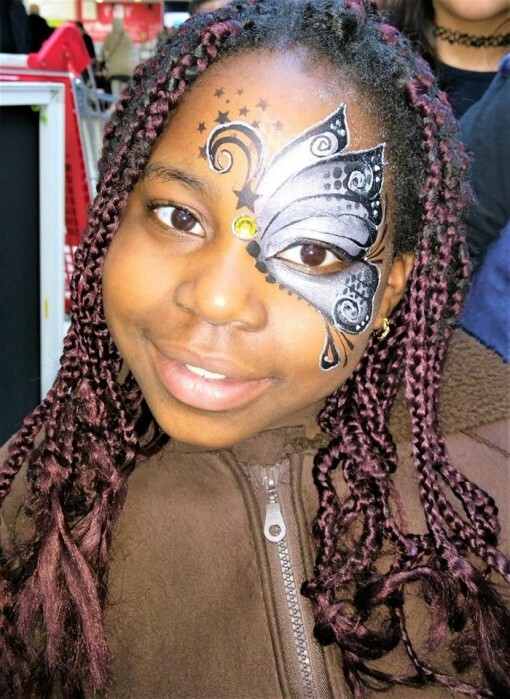 Giovanna of GG’s face painting not only takes great pics of her models her face painting is awesome! 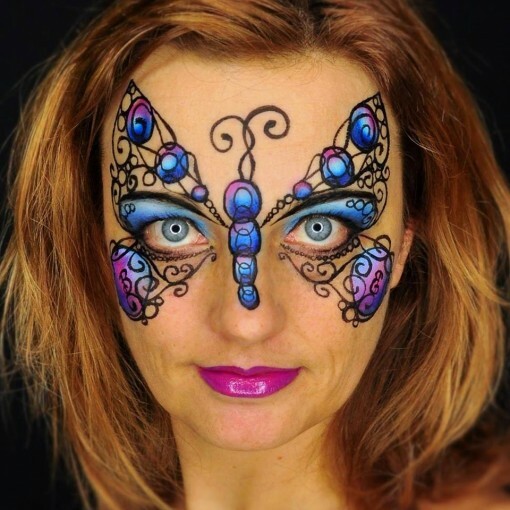 Ester Sagbal all the way from Spain and a loyal FABAtv subscriber sent us this work of art! 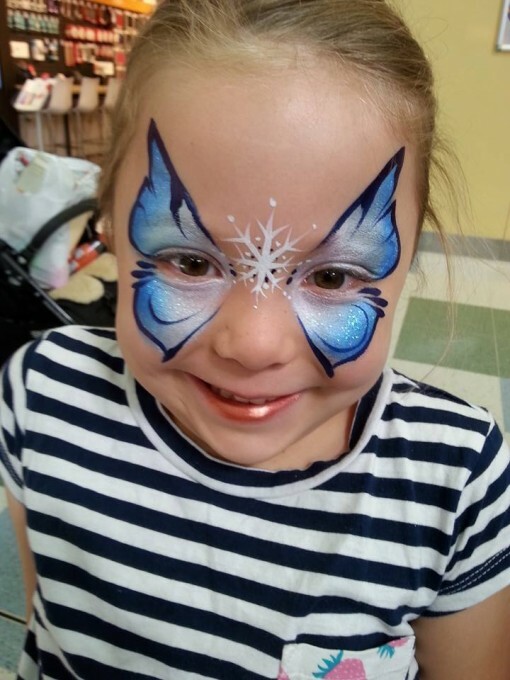 All we could day was say wow! 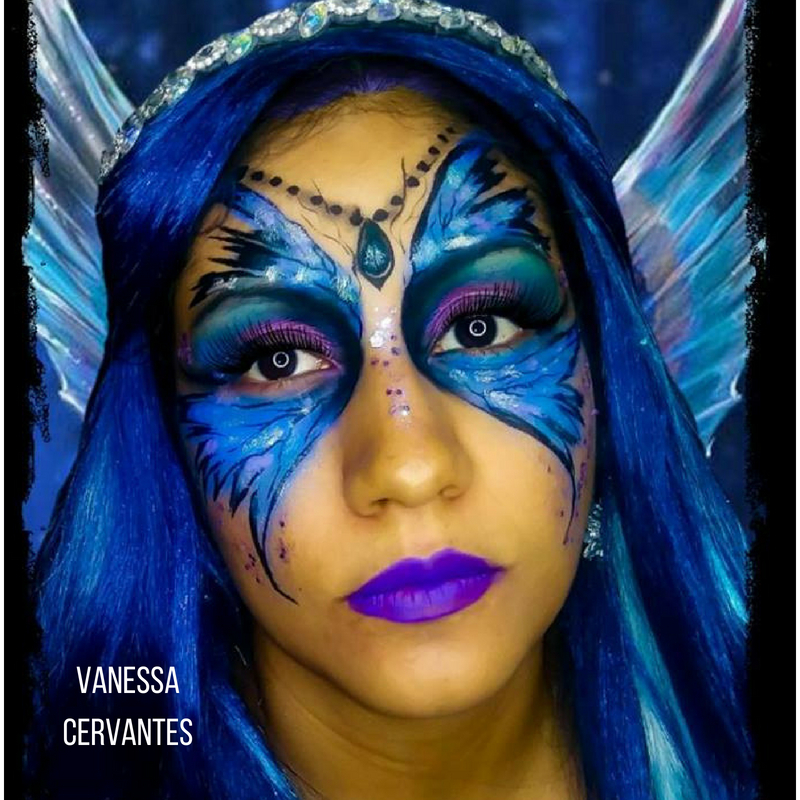 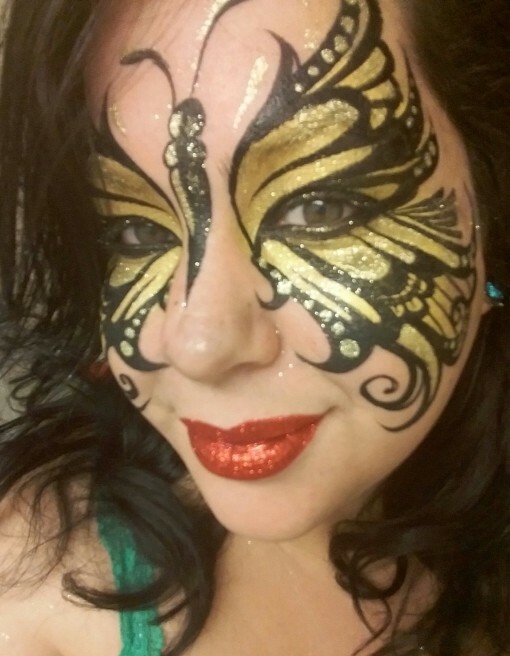 Eyeriz Melissa Perez’s Golden Goddess butterfly is so stunning its a must share! 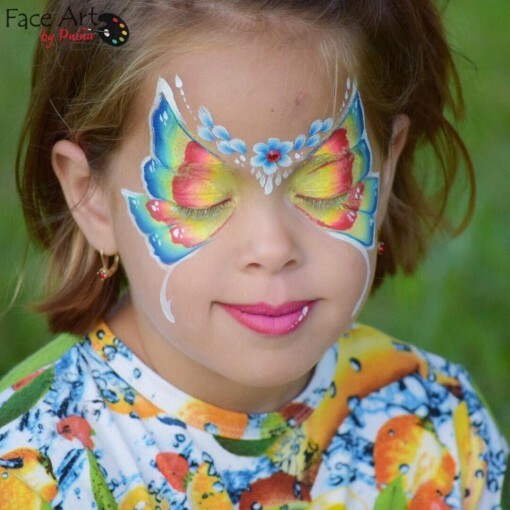 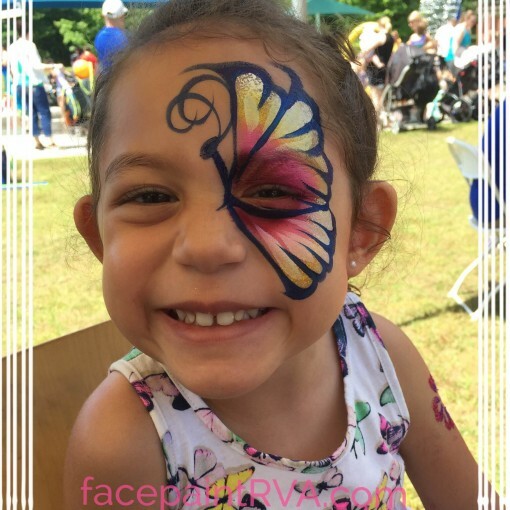 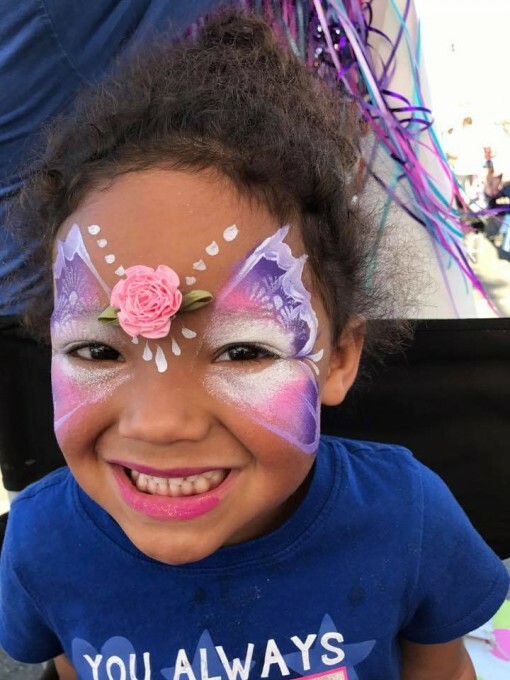 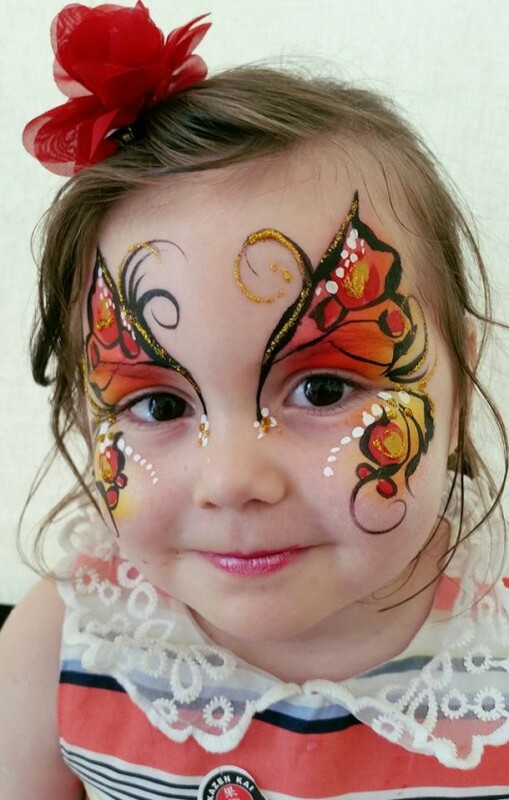 Pikadilly face painting is easily one of my favorite pages to find inspiration and you can see why! 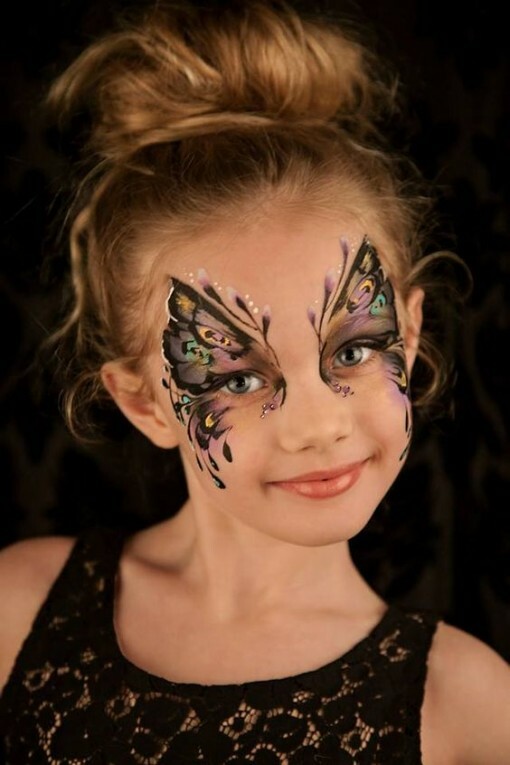 Annie Reynolds is the down under QUEEN of Butterflies. 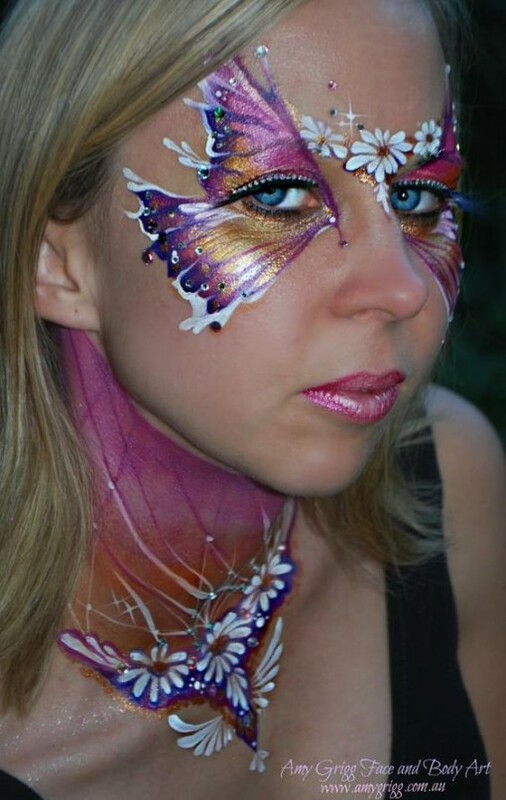 Jenny Saunders NEVER disappoints. 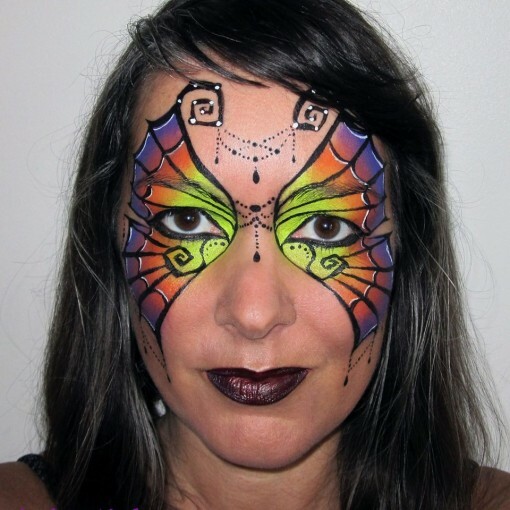 Stunning color, bling and line work perfections. 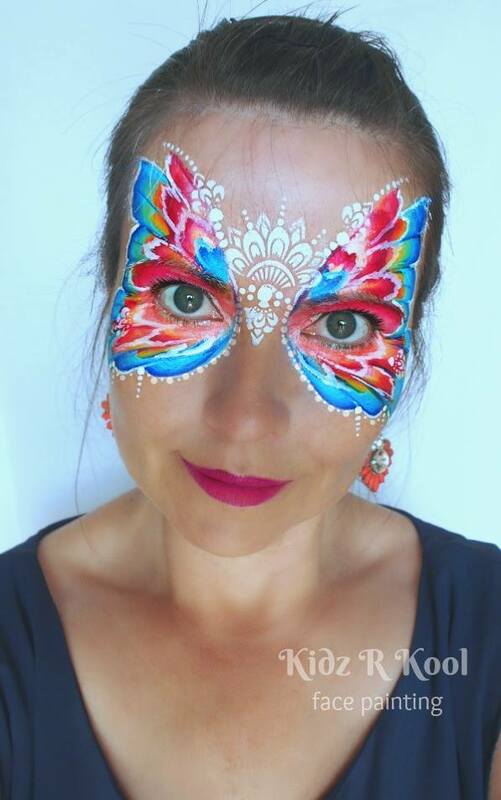 Natalee Davies butterflies are treats for the eyes! 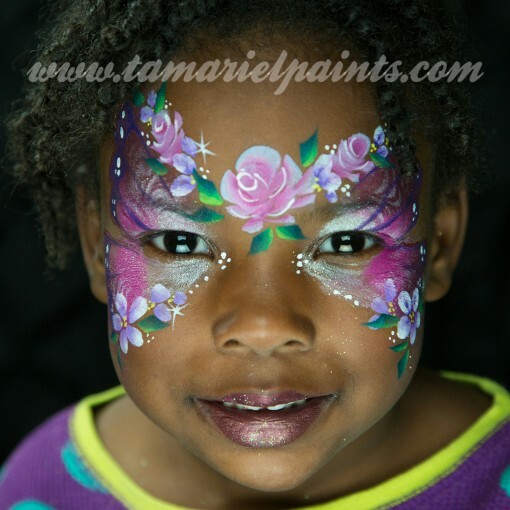 We love everything she paints! 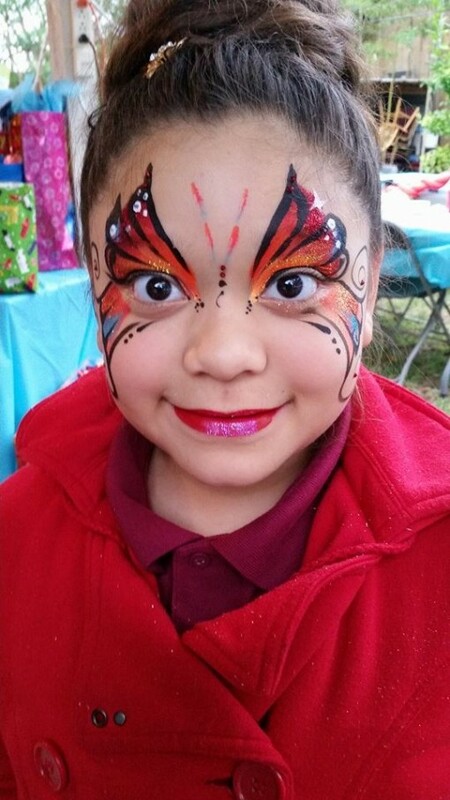 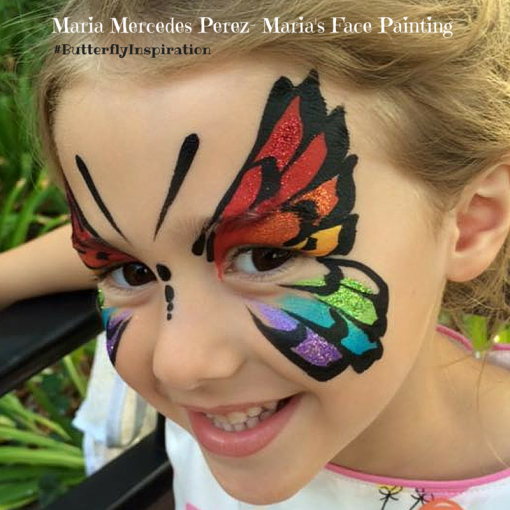 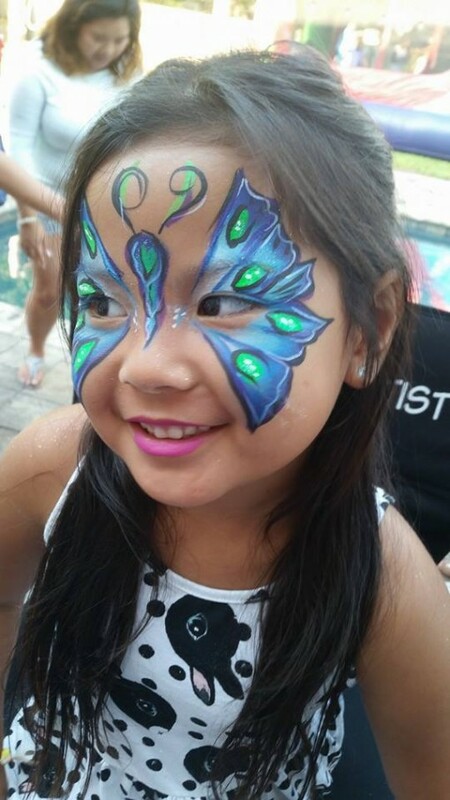 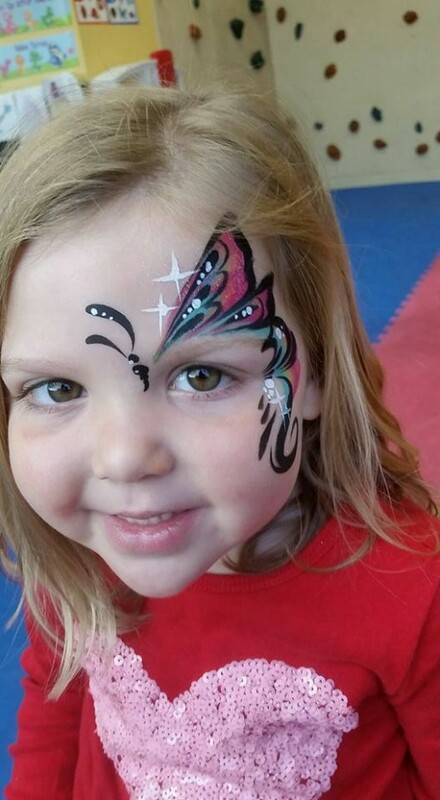 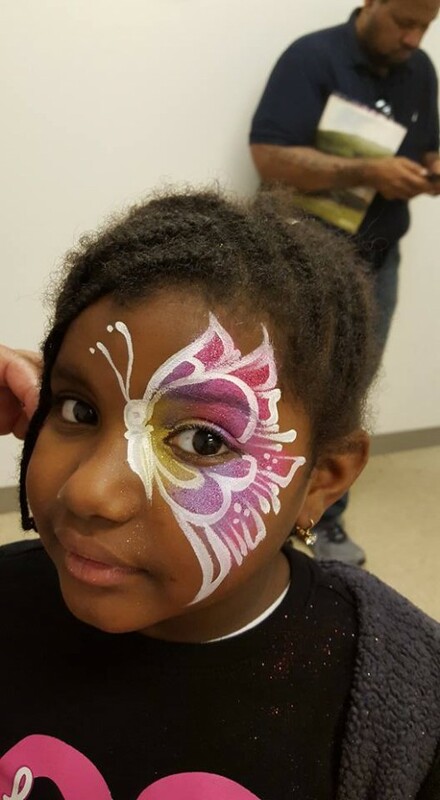 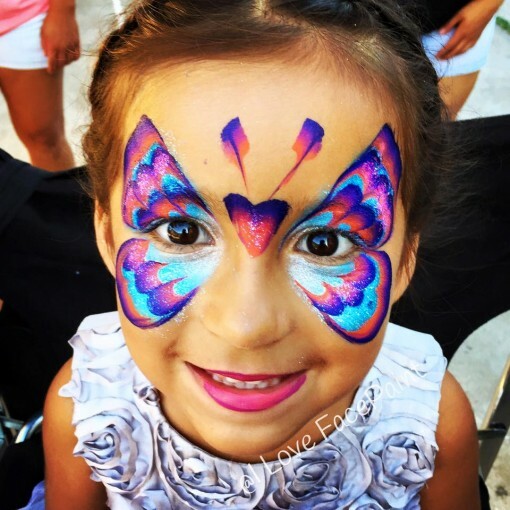 Vanessa Mendoza captured this cutie after painting her with the most spectacular butterfly in a long time! 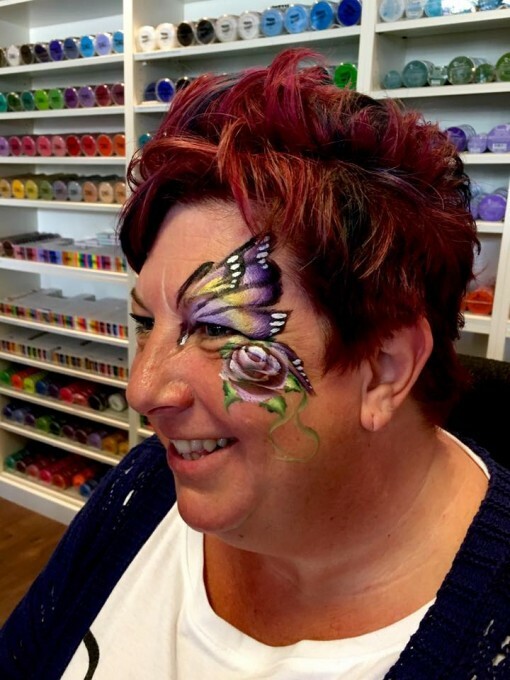 Linda Brandon Powers mixed it up with some rose bling and the end result is a full bloom smile! 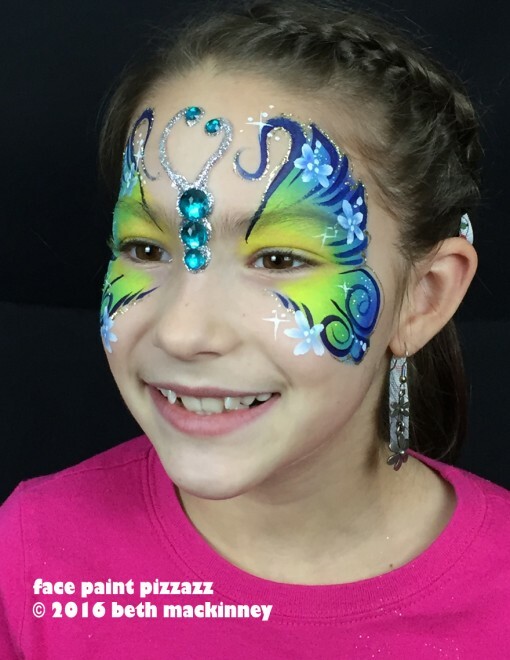 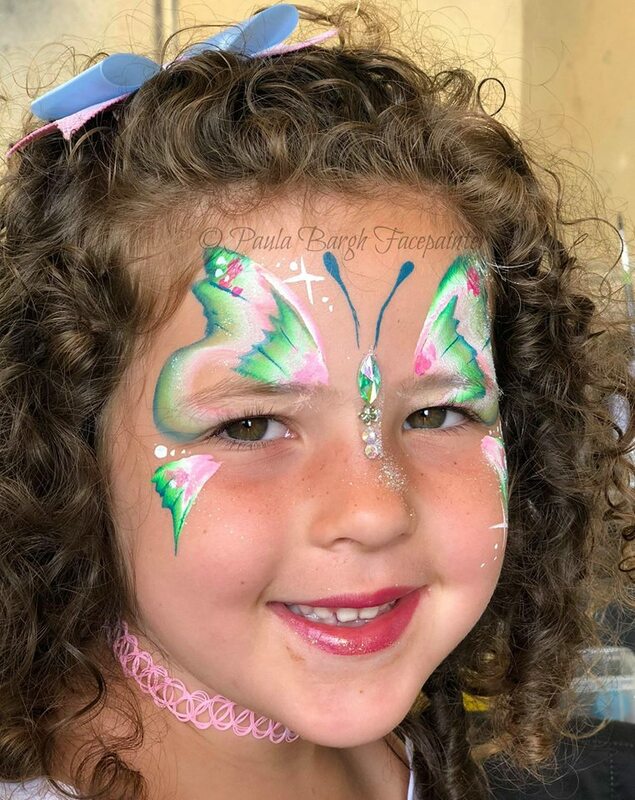 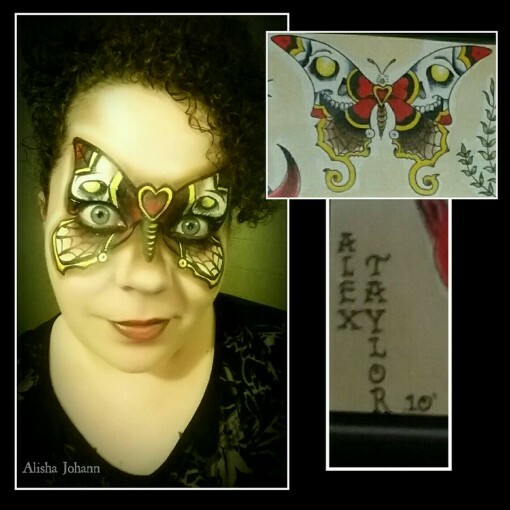 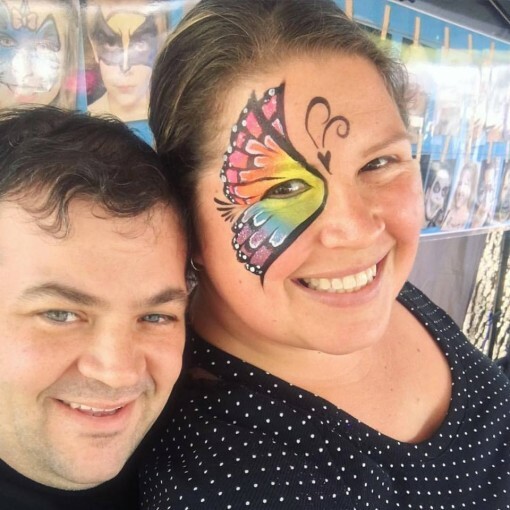 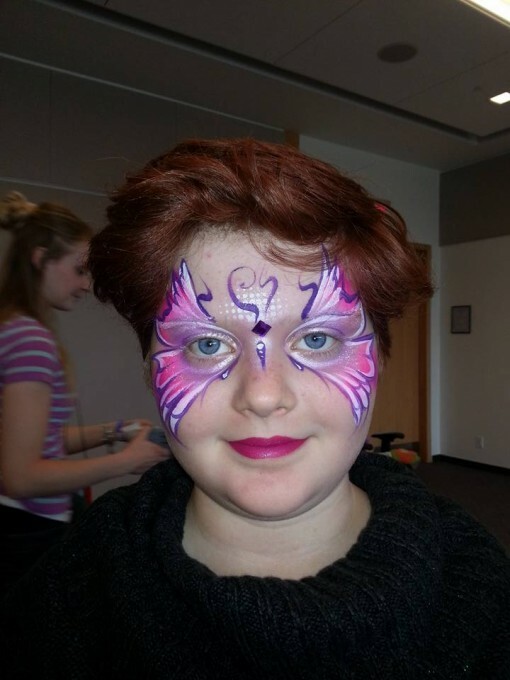 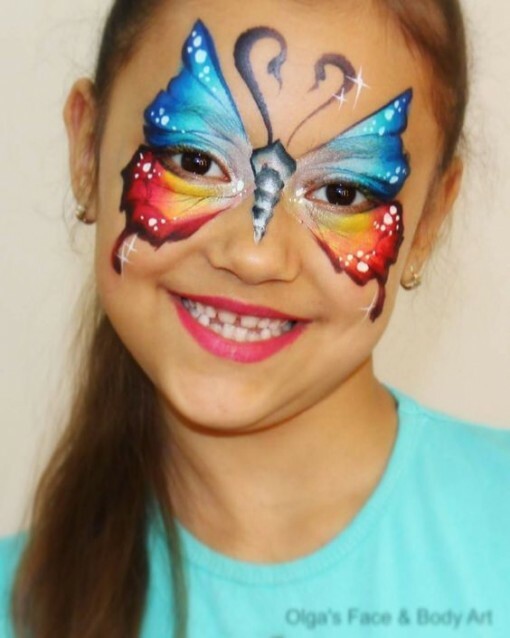 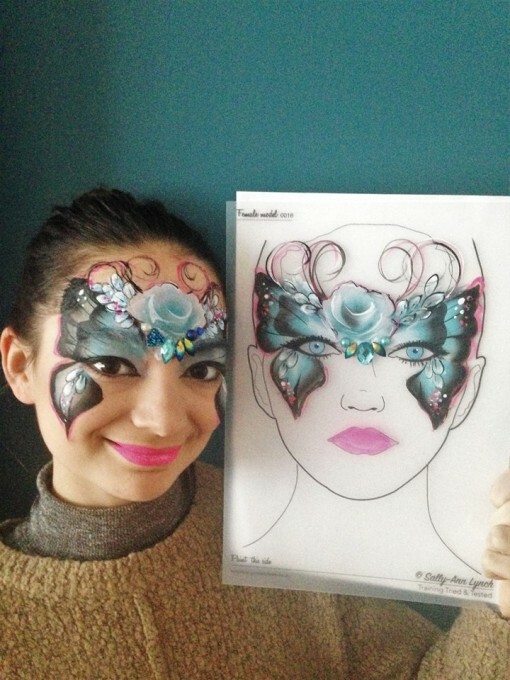 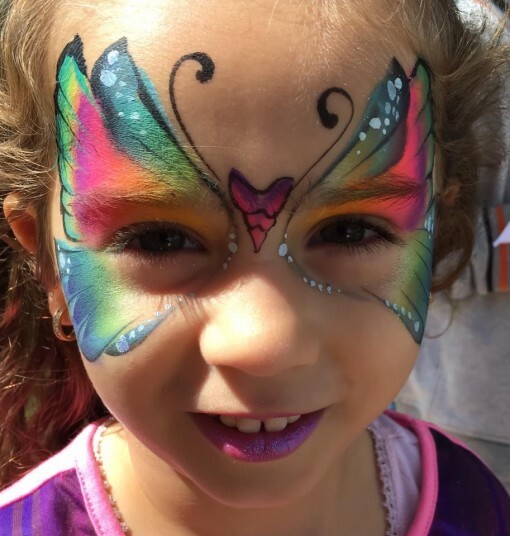 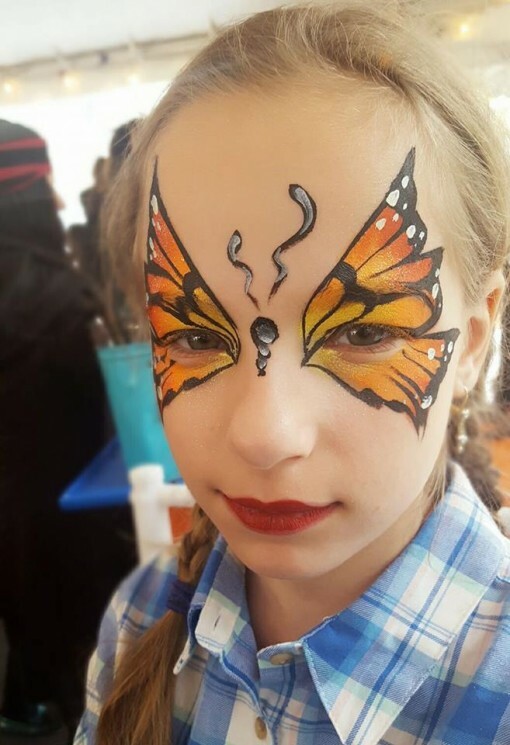 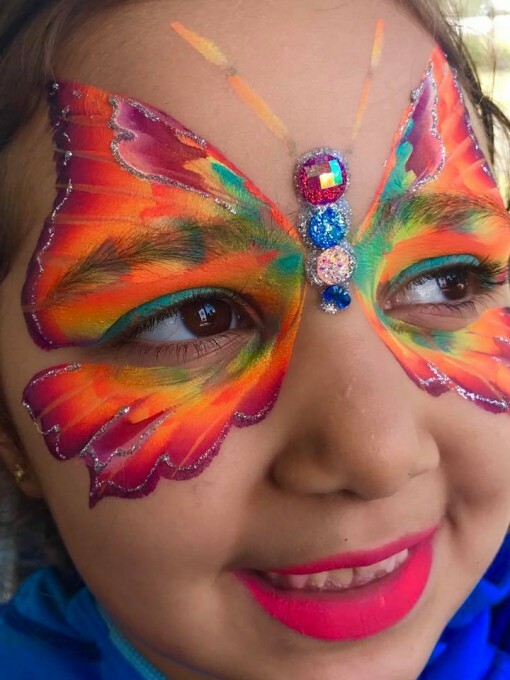 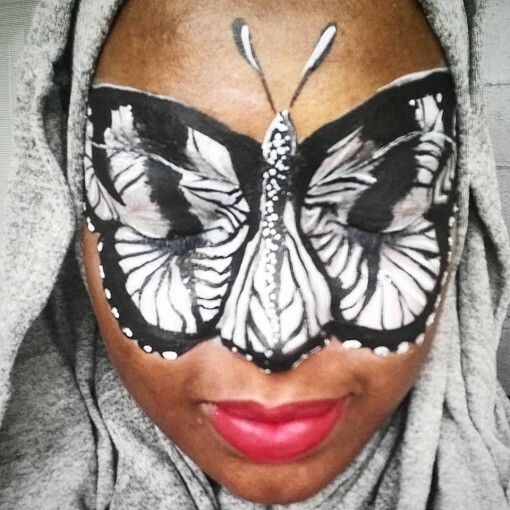 Sara Asker channeled her inner Nurit Pilchin to create an amazing butterfly! Belinda Wurmitzer we loveeeeeee her butterflies so much we asked her to come and share them on FABAtv! 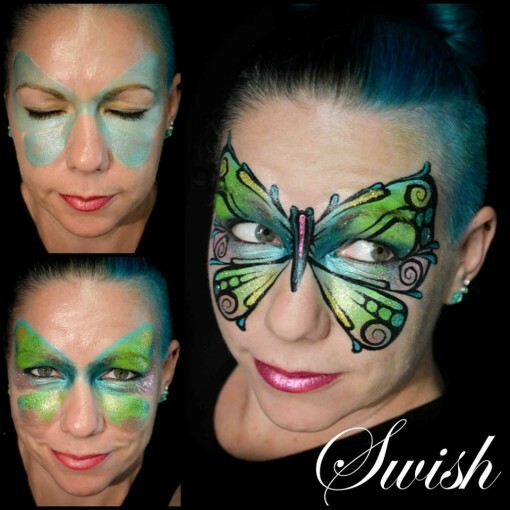 Green never looked os good! 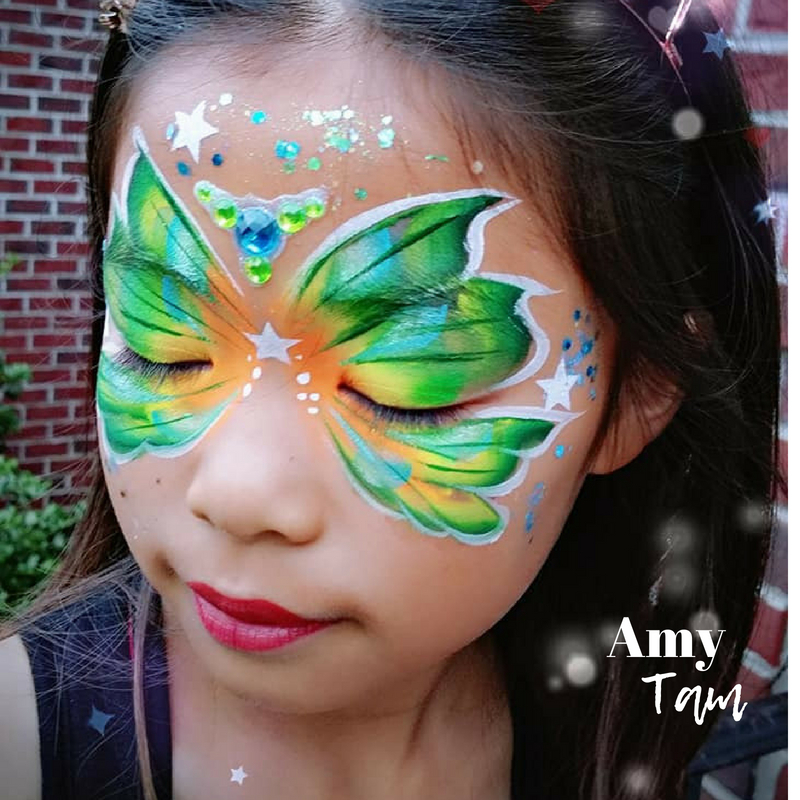 Amy Tam is butterfly magic! 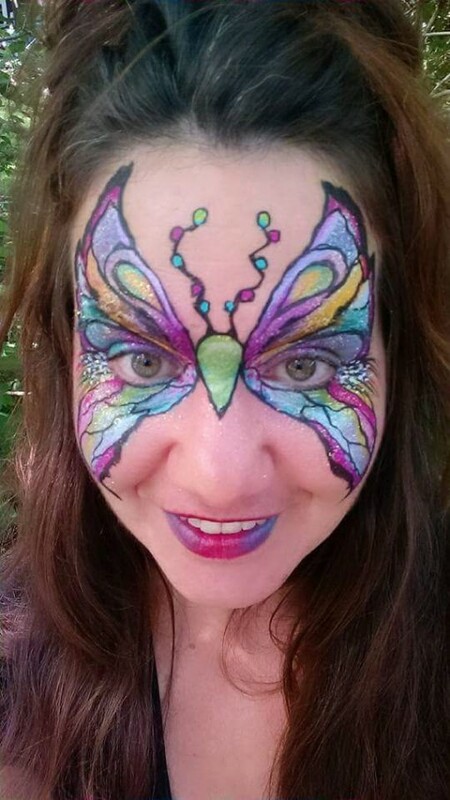 Don’t forget to send me your butterfly to be included. 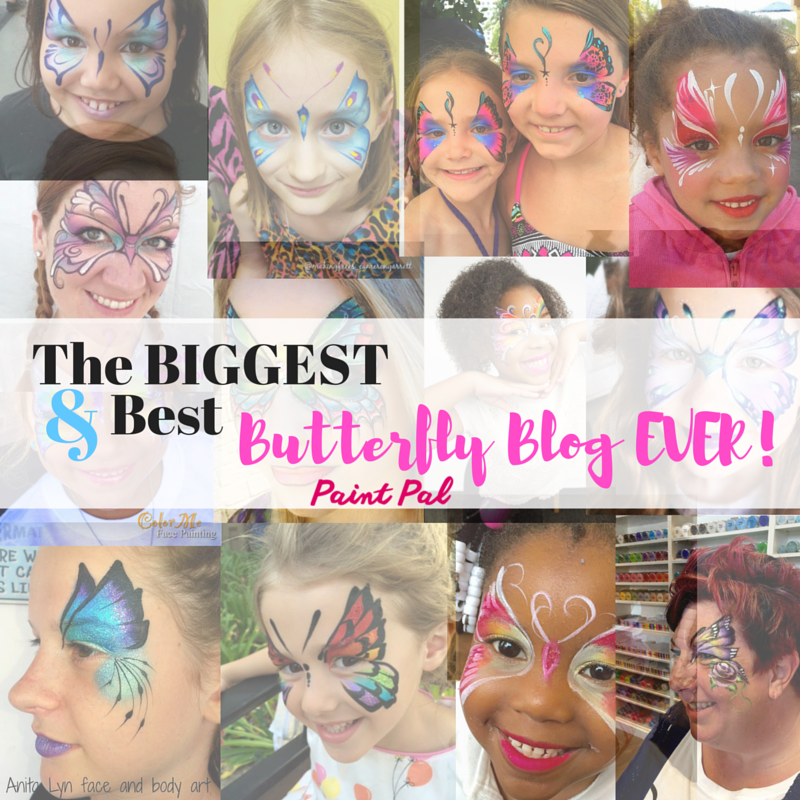 This blog is not so much for me its for YOU!